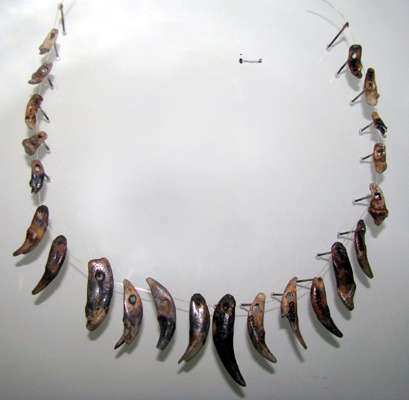 Necklace of pierced Arctic Fox teeth. Necklace of shells. Some appear to be from the nearby Jurassic limestone hills, dug from the ground at the time of completion of the necklace, and are typically a dull or white colour. 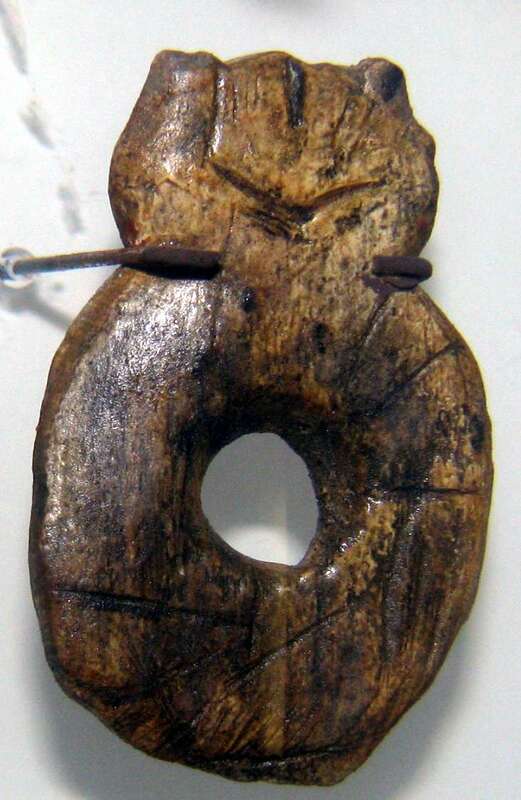 I have marked with a red spot some others which may be contemporaneous with the original construction of the necklace, taken from the far distant seashore some 27 000 years ago. If that is the case, they would have been very valuable at the time. If you click on the image you may see the necklace in a larger format, without the red spots. Most images on this page have a high definition version, obtained by clicking on the thumbnail. 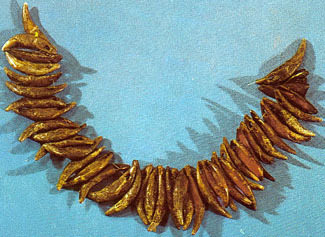 (left) Necklace made of fossil Dentalium badense shells and teeth of the arctic fox, Dolní Věstonice. 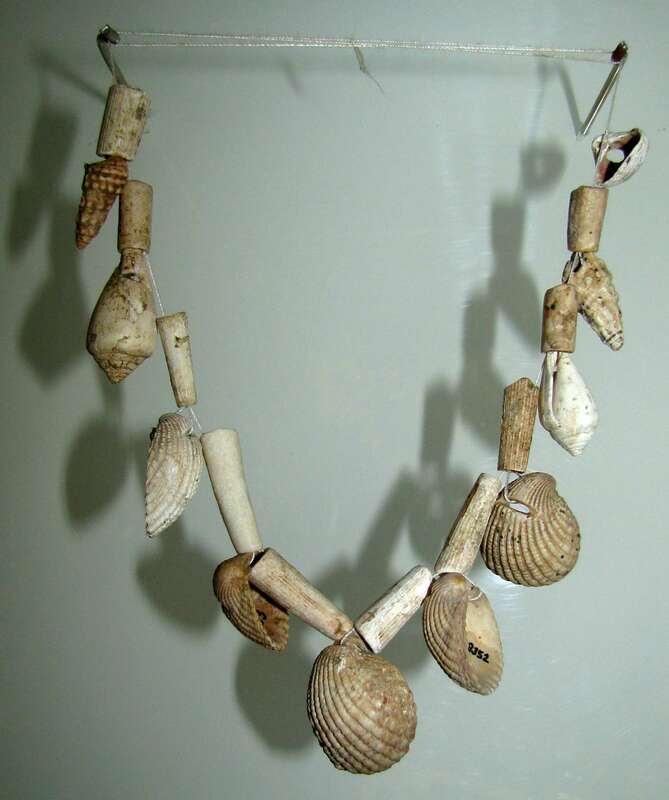 (right) Necklace of fossil Dentalium badense shells. These would have come from the large deposits of Jurassic Limestone which form the peaks just behind the Dolni Vestonice / Pavlov deposits. Their modern descendants are still highly prized as jewellery, and are commonly used by Native North American artists. 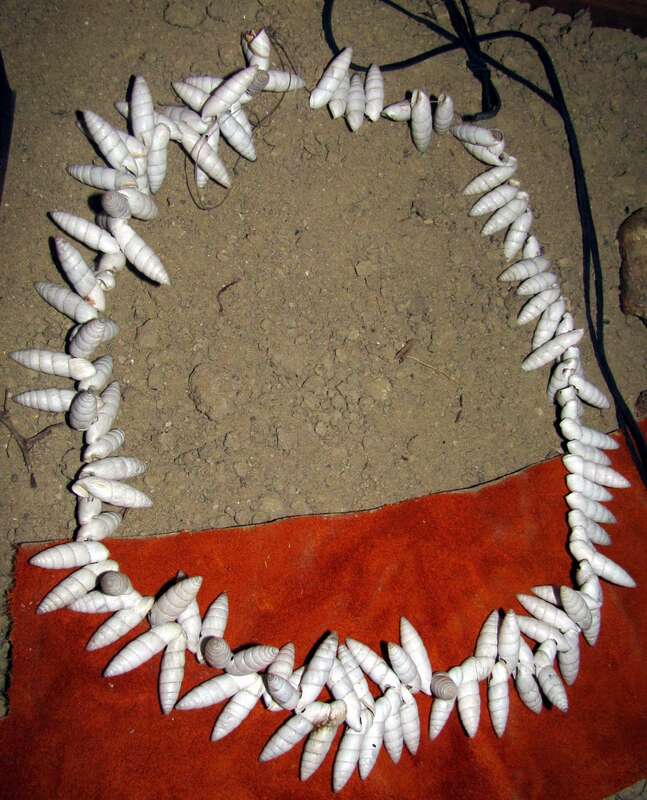 They are often referred to as tusk shells or tooth shells, and are used in indigenous jewellery and personal decoration in Western Canada and the United States. The modern equivalent is Antalis pretiosum, which occurs from Alaska to Baja California, but were mostly harvested, because of (only just!) suitable local tidal and sea conditions, off the coast of Vancouver Island. 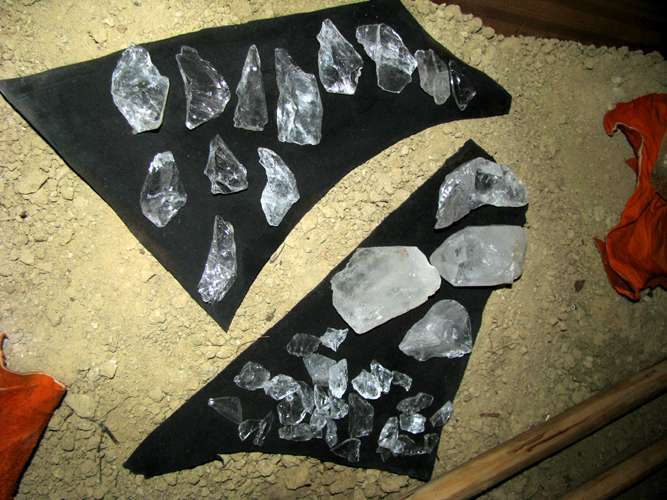 They were regarded as very precious, and were widely traded. These tusk shells are a kind of seashell, specifically the shells of scaphopod mollusks. 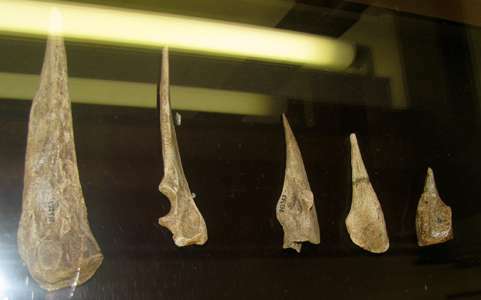 The name 'dentalium' is based on the scientific name for the genus Dentalium, but because the taxonomy has changed over time, not all of the species used are still placed in that genus, however all of the species are certainly in the family Dentaliidae. 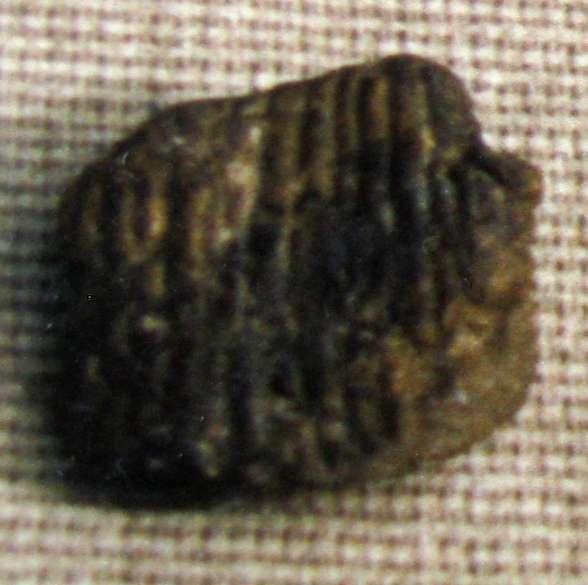 This 'Indian Money Shell', Antalis pretiosum, was formerly Dentalium pretiosum. It has a smooth shell, and lacks the longitudinal linear sculpture of a true Dentalium, and for this reason amongst others was transferred to the Antalis genus (Ron Shimek, pers. comm). 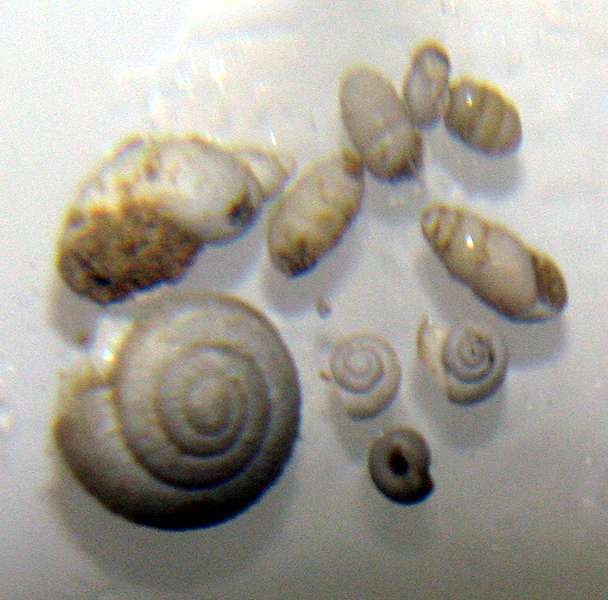 'Dentalium' shells in the trade now are mostly Asian, and of inferior quality. In the Pacific Northwest, 'dentalium' shells were only available from the Pacific coast of Vancouver Island. They were an indicator of wealth and were highly prized. 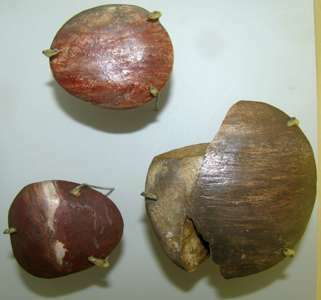 'dentalium' shells were used as decorative elements on clothing accessories and for personal adornment. This wawáq’aqt or choker is from the Rydryck Collection, and combines 'dentalium' shells, blue glass beads and brass beads sewn onto a single piece of leather with buckskin ties. The bracelet on the left is from the Spalding-Allen Collection and combines 'dentalium shells,' black pony beads and leather spacers with buckskin ties. 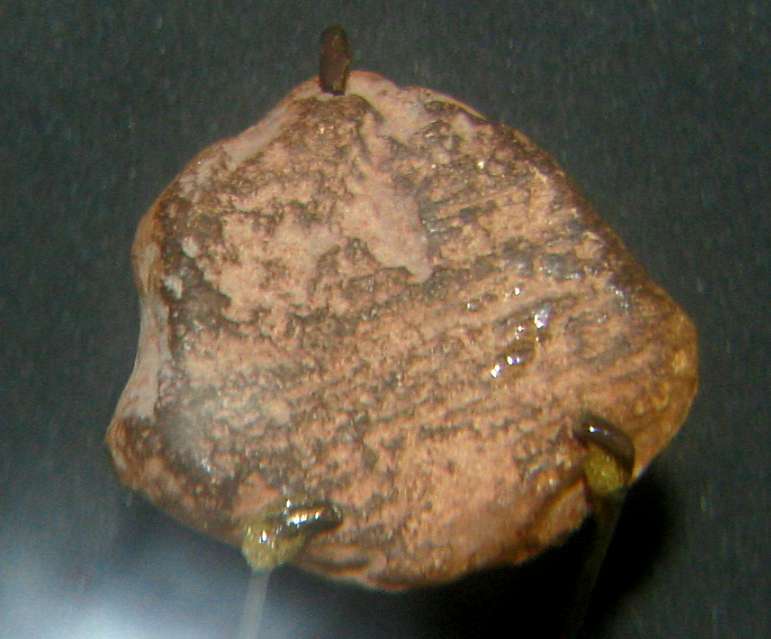 It is assembled with sinew. Bracelet 1830s Shell (Antalis pretiosum), glass beads, leather. L 26 cm. Permission: This work is in the public domain in the United States because it is a work of the United States Federal Government. Text: Partly adapted from Wikipedia. 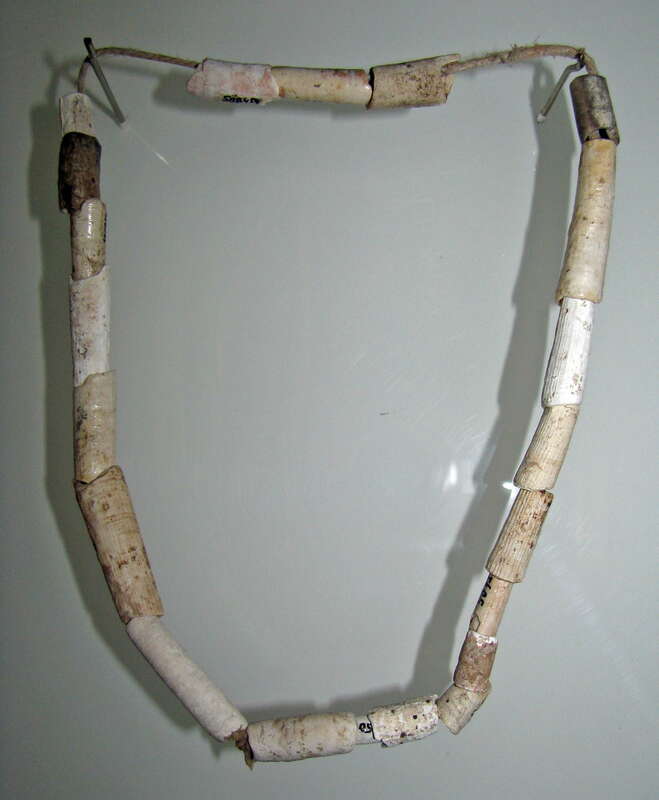 The following is an edited personal communication from Ron Shimek, a leading researcher in scaphopod research, when I asked him about the grooves on some of the shells in the wikipedia image of the traditional native american choker and bracelet above. My thanks for his clear explanations and vast specific and general knowledge on this topic. 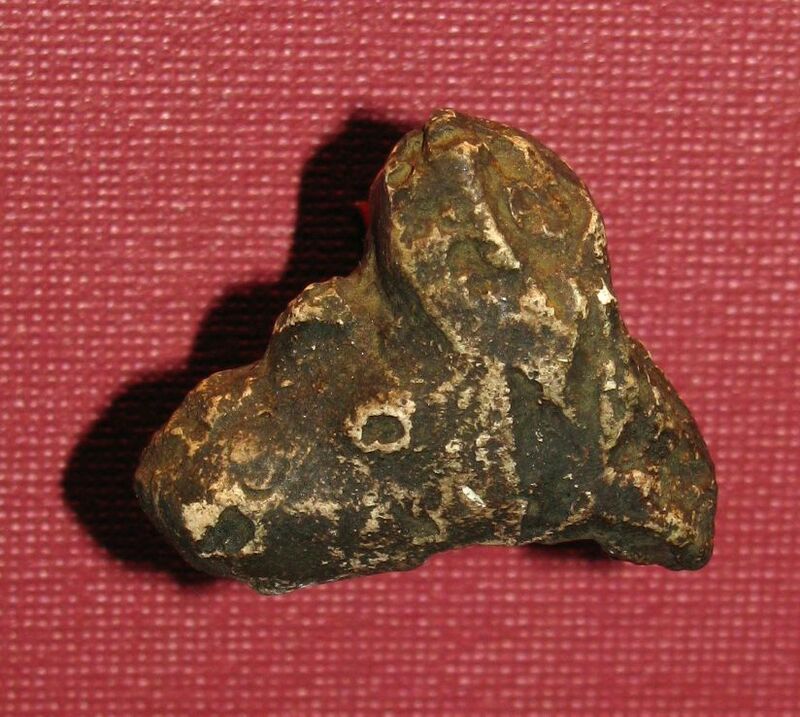 The Wikipedia image is of an item made rather late in period of the use of these shells. 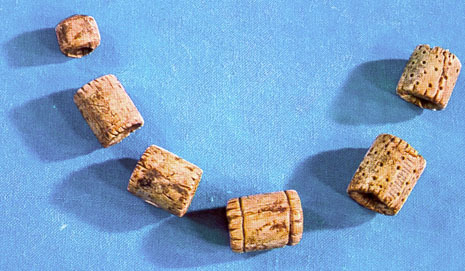 I suspect, by the type of trade beads used, that it was made in the late 1800s. 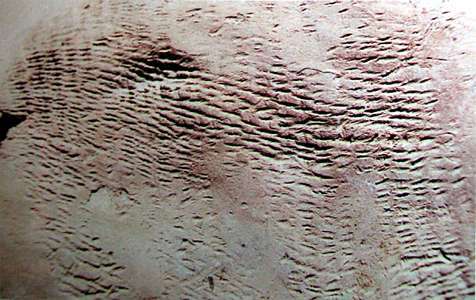 The shells with grooves are not Antalis pretiosum (which is always smooth). 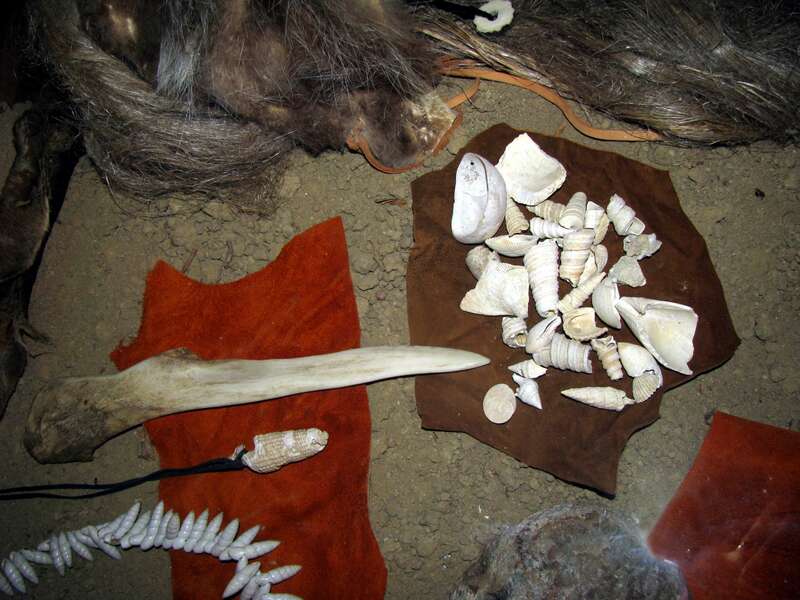 By the end of the nineteenth century most of the tribes that used the dentalium shells as decoration were being settled on what were called 'reservations', and the trade in the shells from the west coast of North America was largely over. 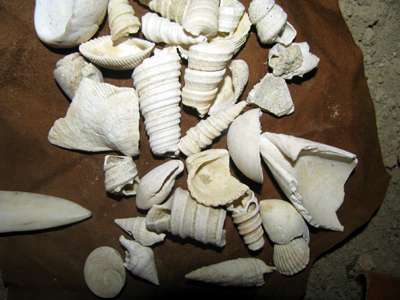 However, there still was a demand for the shells, and there still were a lot of shells in circulation. 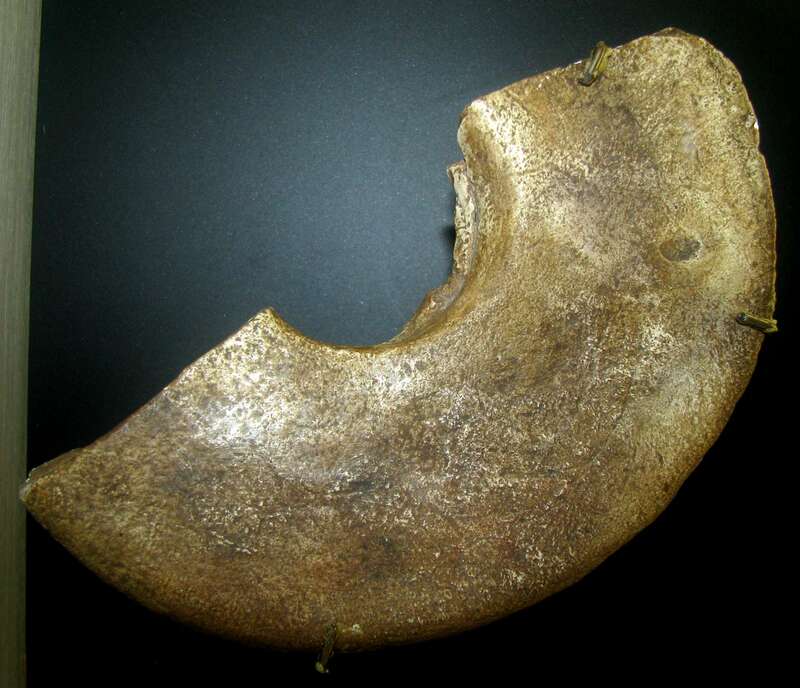 By this time traders were bringing in dentalium shells from Europe or New England. Most of the shells the traders brought in were Antalis entale from the North Atlantic. These are effectively indistinguishable from Antalis pretiosum. The two species are probably descendant from an ancestor that lived in the Arctic Ocean prior to the ice ages, perhaps a couple of million years ago. However, not all of the shells that the white traders imported were Antalis entale, some were the European species Dentalium dentale as shown in the image above, with distinct grooves/ridges. The reason the name change occurred from Dentalium pretiosum to Antalis pretiosum was due to a re-examination of the various scaphopod species by some taxonomists in the late 1980s. 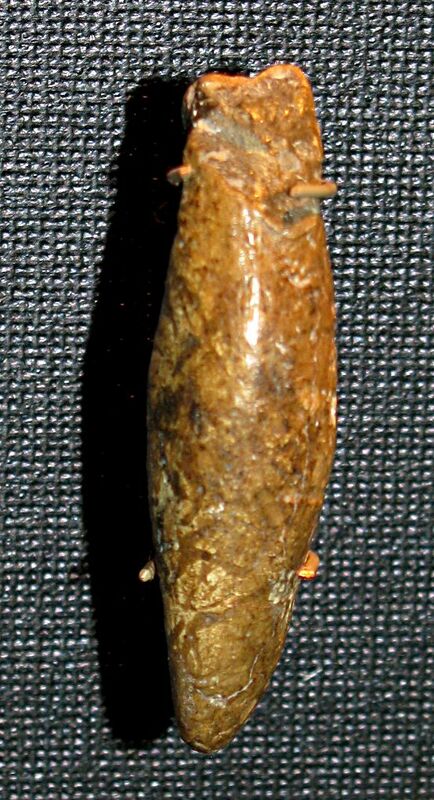 The first scaphopod to be given a scientific name was Dentalium dentale, named by the original taxonomist, Carl Linnaeus in 1766. 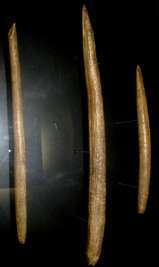 In doing so, he defined the genus 'Dentalium' as having longitudinal ribs or ridges. 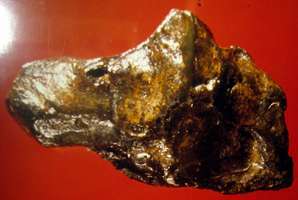 That definition meant that all species given the name Dentalium should bear ridges. 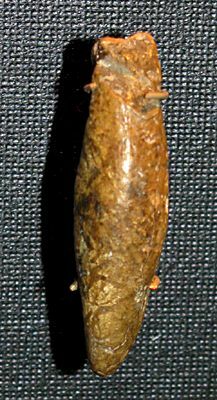 Later some other taxonomists, (H. Adams & A. Adams, 1854) realizing that many scaphopods didn't have ridges, created (or defined) the genus Antalis in 1854. Antalis differed from Dentalium primarily in that it lacked the 'characteristic' ridges found on Dentalium. The Adams' description used as the 'type', or the formal example of the 'typical' species, a species that had been called Dentalium entale, which henceforth was to be called Antalis entale. The Adams' changes in the names were reasonable and valid, and should have been immediately accepted, but because no specialists were working with the group, the use of names in the group remained static and incorrect. 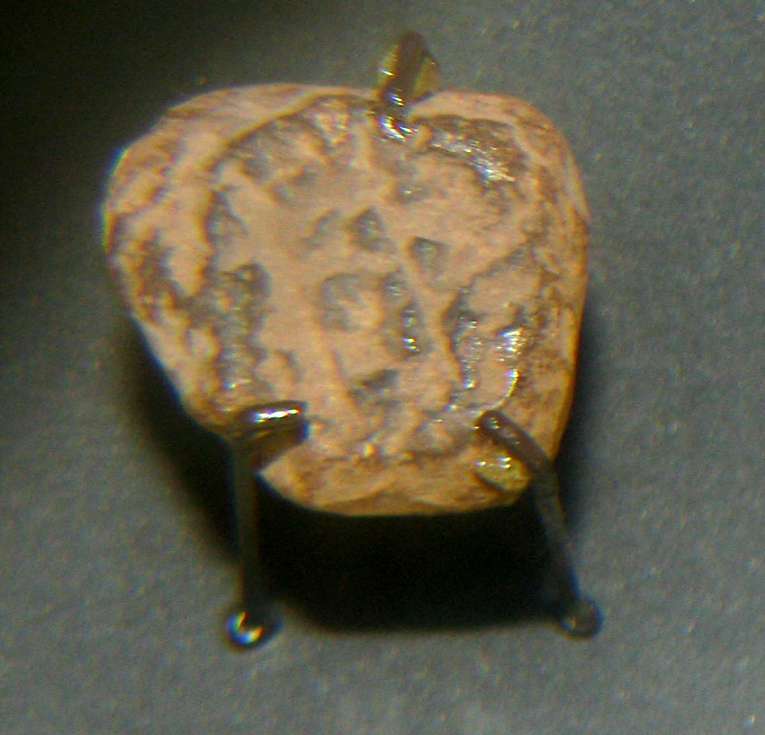 In 1983 I and several other researchers started some research on scaphopods. I worked mostly on the natural history and ecological interactions of the scaphopods in the NE Pacific, Gerhard Steiner worked on anatomy and taxonomy, and mostly worked on European animals, Pat Reynolds worked on physiology also mostly on the NE Pacific critters, and there were some others as well. Steiner re-evaluated the taxonomy and revised most of the European and Atlantic species giving them the proper names (in this case, Antalis instead of Dentalium). I did the same for the NE Pacific. Carved ornament, possibly for the neck or forehead. 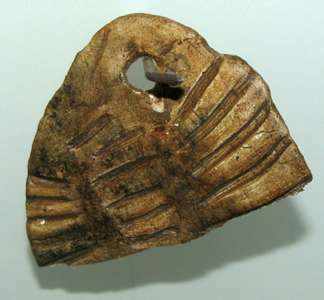 Predmost bone pendant, 28 000 BP - 29 000 BP. Necklace made of small perforated and decorated cylinders of mammoth ivory, Dolní Věstonice. Fragment of what may have been an item worn around the neck, or a decoration on the head or forehead. From the shape, I would expect it would have been worn horizontally, with a hole for a thread at each end. Body ornaments of this type are believed by some researchers to confer protection of some kind, depending on the particular design. But perhaps they were worn for adornment only, as is the case today. Close beside the first owl, and under the same magnifying glass, was this very similar owl pendant, I believe by the same sculptor. These are fascinating objects. In some societies, such as British and Japanese, the owl is seen as wise. In others, such as the Romanian society, seeing an owl is a foretelling of a death in the family. In the 1967 novel by Margaret Craven, "I Heard the Owl Call My Name" about a young missionary in a remote area of British Columbia, hearing an owl "call your name" is a foretelling of your own imminent death to the indigenous Canadian people. 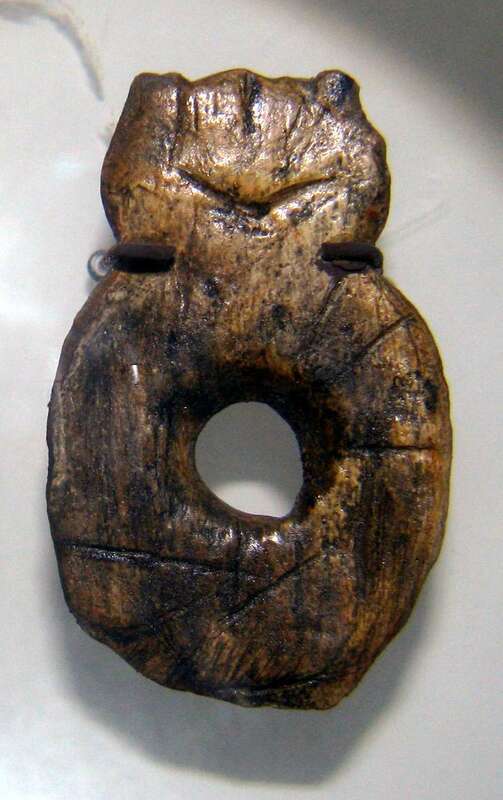 I can't help but wonder how the owl was perceived in the Dolni Vestonice / Pavlov area, 27 000 years ago. Was the owl seen as wise, perhaps? 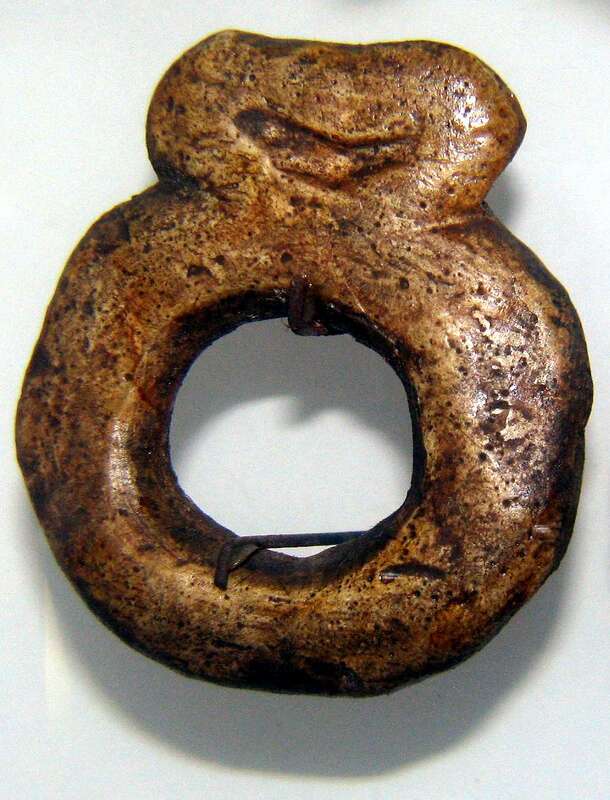 And if so, was the amulet worn in order to distinguish a wise person, or in order to confer wisdom? Or did it have some other significance entirely? Did it confer protection of some kind? Surely we shall never know. 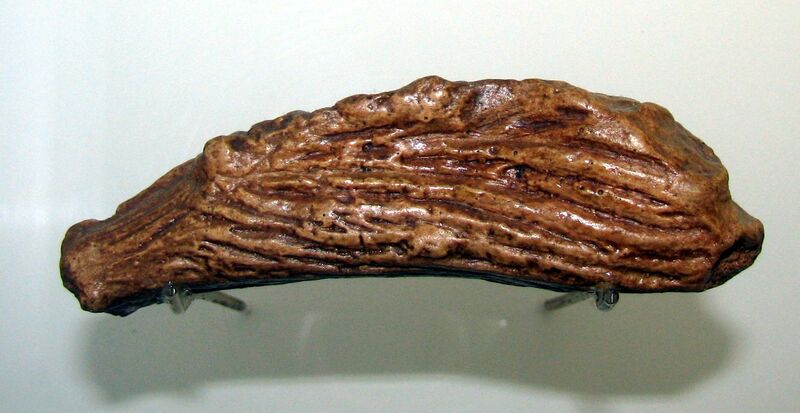 This relatively large carved object may have been worn on the chest, or, given its curvature, as a headpiece. 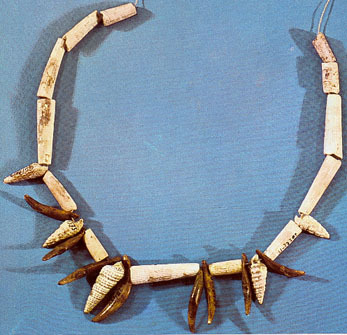 Necklace made of teeth from arctic foxes, Dolní Věstonice. These facsimile shells are of Zebrina varnensis, a terrestrial species found in dry shrub, weed, and steppe vegetation, often on and around limestone rocks. I am very grateful to Professor Dr. Matthijs Vos, Universität Bochum, Fakultät für Biologie und Biotechnologie, Lehrstuhl für Evolutionsökologie und Biodiversität der Tiere and Professor Dr. Menno Schilthuizen, Senior researcher, 'Endless Forms' group, Naturalis Biodiversity Center and Leiden University for this authoritative identification. Presumably fossil shells extracted from the Jurassic limestone deposit nearby. It would be interesting to know how the shells were extracted from the limestone with minimal damage by the original inhabitants. 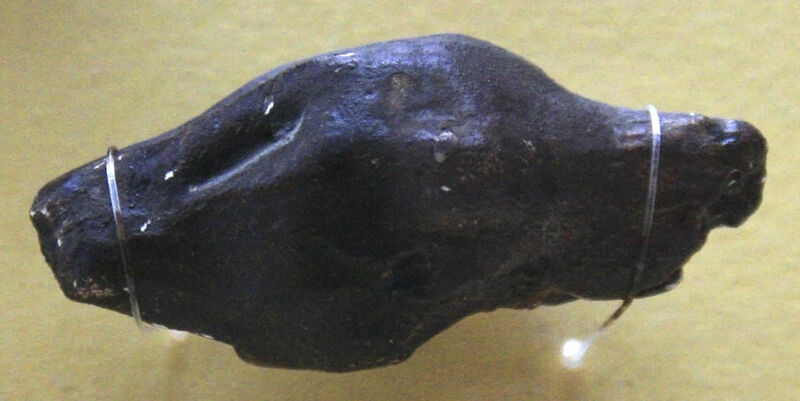 They may have been extracted naturally by acid water lying on the limestone in swamps, and then been available for the taking, although the documentary makers who produced these particular shells for the film would have had access to modern methods, of course. 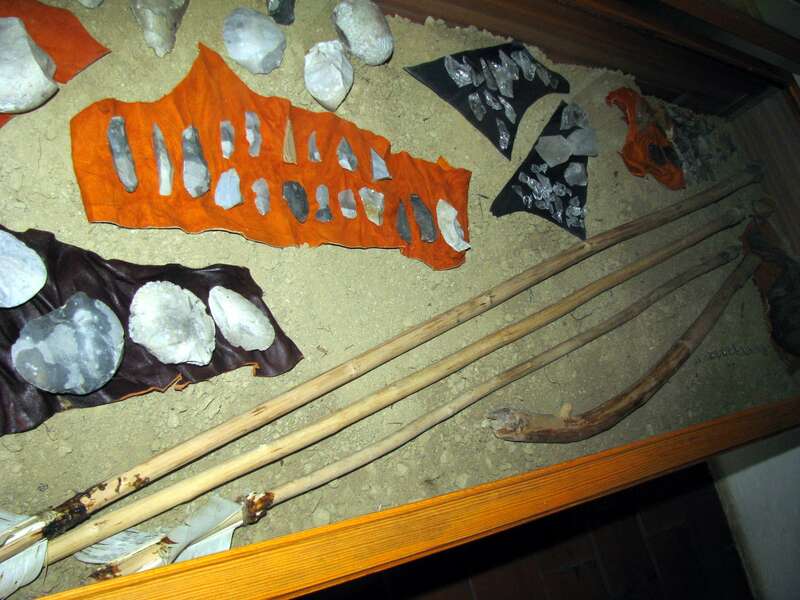 The display was beautifully put together, with a combination of modern materials such as hair and wood and leather and feathers, mixed with the recovered artefacts. Source: Facsimiles, mixed with modern materials, display, Dolní Věstonice Museum, put together for the "Úsvit géniů" documentary. 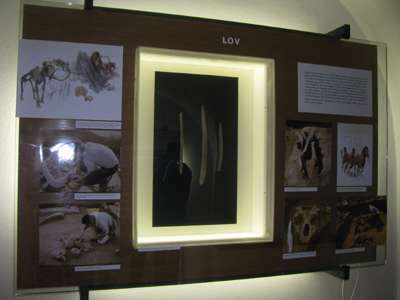 This display, though lacking an interpretation card, shows some of the materials used by the inhabitants of Pavlov and Dolni Vestonice, as well as some of the artefacts they created. 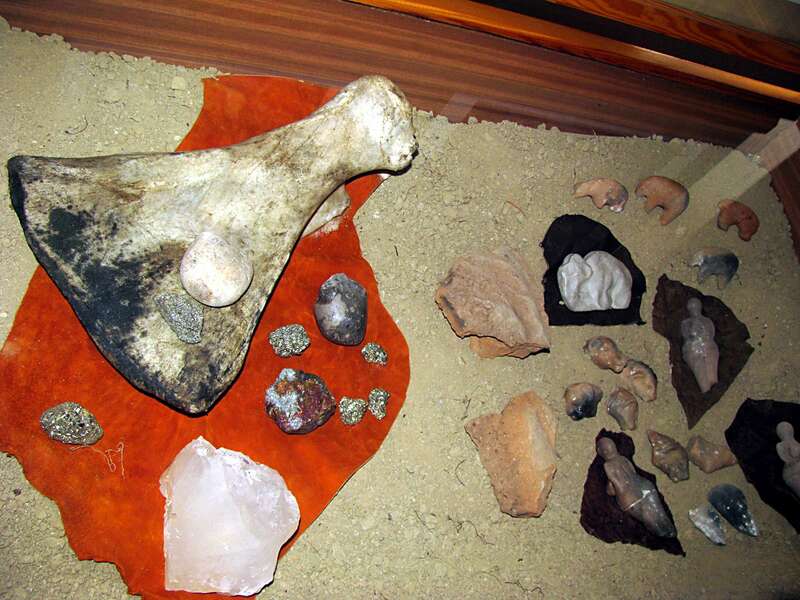 On the mammoth scapula we can see a hammer stone beside a piece of what may be iron pyrites, FeS2 which when struck by the stone would produce a spark sufficient to start a fire in specially prepared dry tinder. There is also a brightly coloured iridescent specimen of the much less common Peacock ore, which may be either chalcopyrites CuFeS2 or the true peacock ore, Bornite, Cu5FeS4. Marcasite has the same chemical formula as Iron Pyrites, but occurs in a different crystalline structure, and may be better in some cases to create fire. Carved bones. 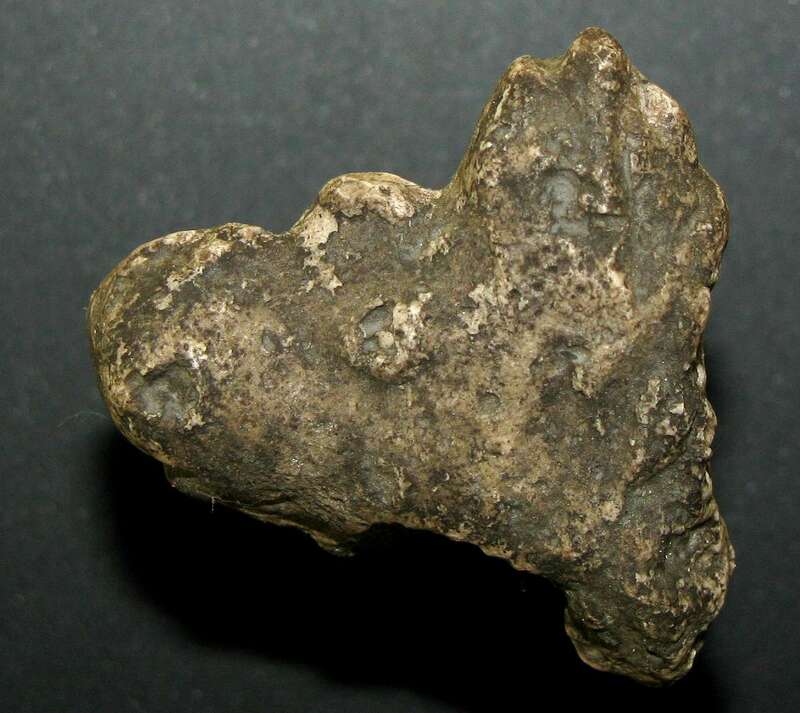 The object on the right is part of the oldest recorded map, shown in more detail below. It shows the Dyje river and the slopes of the Dolni Vestonice hills. 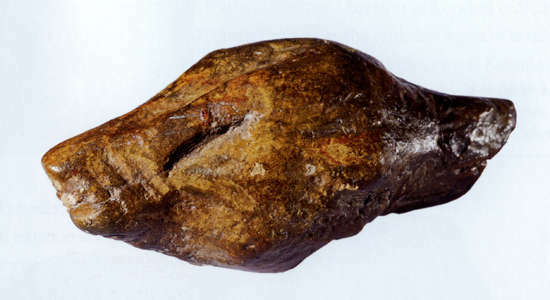 Enlargement of the part shown of the mammoth tusk on the right of the photograph above. This may be the earliest map ever found. It is a drawing of an engraving on a mammoth tusk. 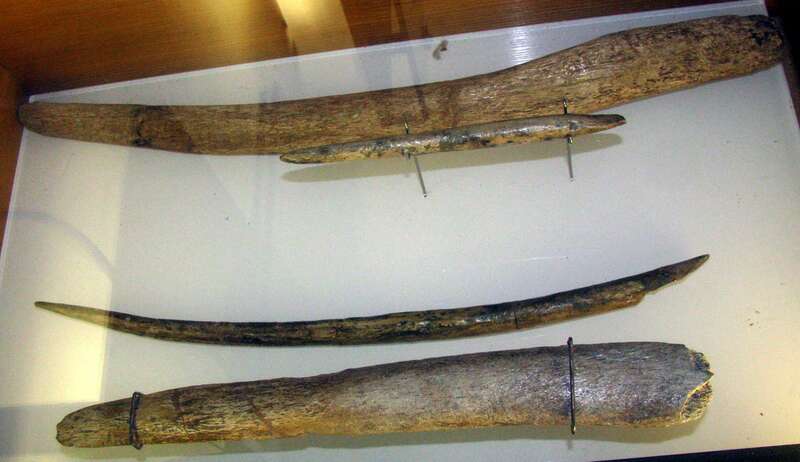 The mammoth tusk was found in 1962 at Pavlov, near Dolni Vestonice. The map is printed in a leaflet kindly sent to me by Fritz Lange, obtained from the "Weinviertel-Museumsdorf", in the building called "Suedmaehrerhof", where there was in 2008 a replica of the Venus von Unterwisternitz (or Dolni Vestonice) and an exhibition about the finding of the Venus. 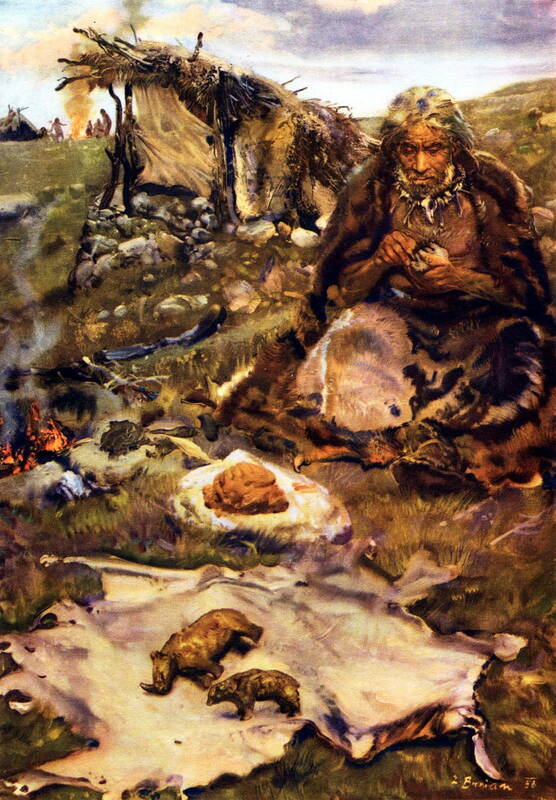 The drawing is probably taken from a book by the eminent Austrian scientist Irenäus Eibl-Eibesfeld, founder of the field of human ethology, and former student of Konrad Lorenz. 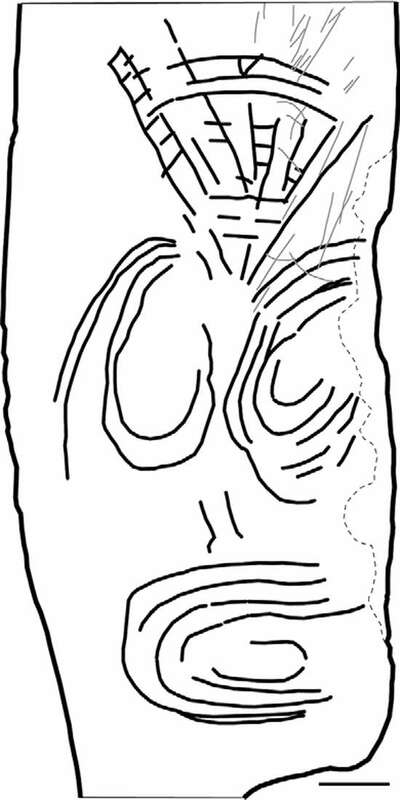 Source: Leaflet from the "Weinviertel-Museumsdorf"
After conservation in the laboratory it was recognised as the oldest map of the Pavlovian/Dolni Vestonice landscape, with the Dyja river interpreted with meanders, the ridges and erosion gullies of the loess slopes, and the rocky peaks all shown. Amidst this is a double motif of a complete circle and a half-circle. It is assumed that this marks the home of the hunters. The engravings show a striking agreement with the landscape formation (view from the north, looking south). Photo: Don Hitchcock 2008, expertly enhanced by Fritz Lange 2010. Moravia, which includes the Dolni Vestonice/Pavlov sites, is one of the major centres of the oldest art. 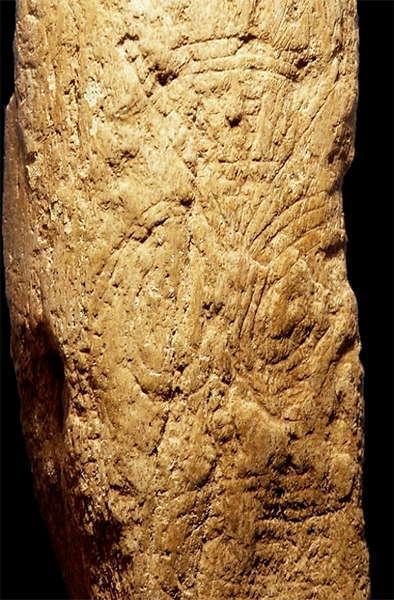 In light of the new discovery, it seems as if the first art was suddenly created and "ready" at a time when people of a modern type first colonised Europe. Undoubtedly this is related to underlying changes in thinking, including consciousness of space and time. The staff itself was quite unusual. It was not newly carved, that much was obvious. 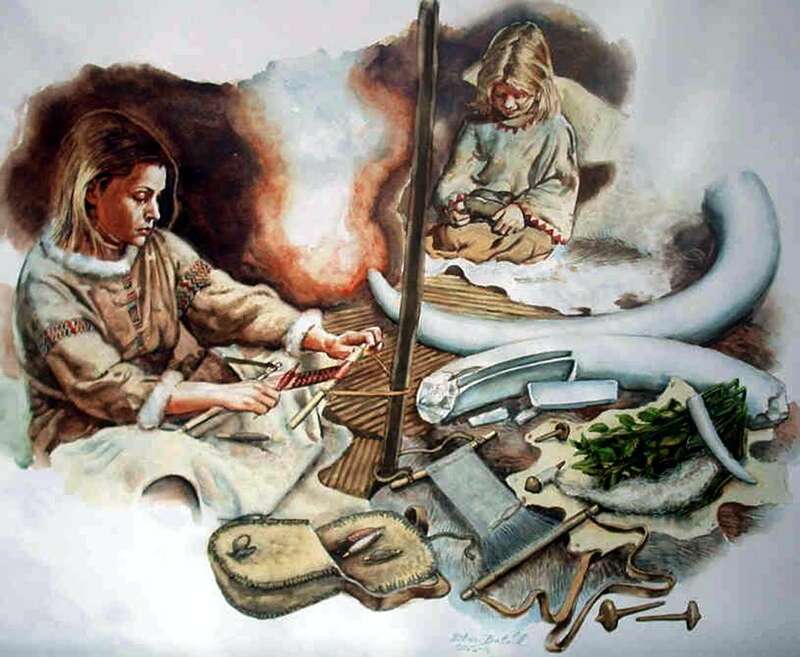 The color of the mammoth ivory had begun to turn creamy, and the area where it was usually held was gray and shiny, caused by the accumulated dirt and oils of the many hands that had held it. It had been used by many generations. 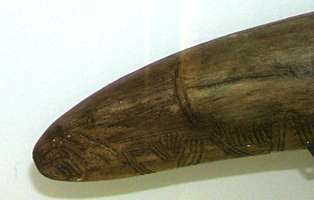 The design carved into the straightened tusk was a geometric abstraction of the Great Earth Mother, formed by concentric ovals to shape the pendulous breasts, rounded belly, and voluptuous thighs. The circle was the symbol for all, everything, the totality of the known and unknown worlds, and symbolized the Great Mother of All. The concentric circles, especially the way they were used to suggest the important motherly elements, reinforced the symbolism. The head was an inverted triangle, with the point forming the chin, and the base, curved slightly into a domelike shape, at the top. The downward pointing triangle was the universal symbol for Woman; it was the outward shape of her generative organ and therefore also symbolized motherhood and the Great Mother of All. 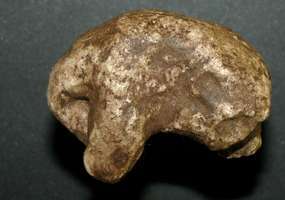 The area of the face contained a horizontal series of double parallel bars, joined by laterally incised lines going from the pointed chin up to the position of the eyes. The larger space between the top set of double horizontal lines and the rounded lines that paralleled the curved top was filled in with three sets of double lines that were perpendicular, joining where eyes would usually be. But the geometric designs were not a face. Except that the inverted triangle was placed in the position of a head, the carved markings would not even have suggested a face. The awesome countenance of the Great Mother was too much for an ordinary human to behold. Her powers were so great that Her look alone could overwhelm. The abstract symbolism of the figure on Attaroa's Speaking Staff conveyed that sense of power with subtlety and elegance. 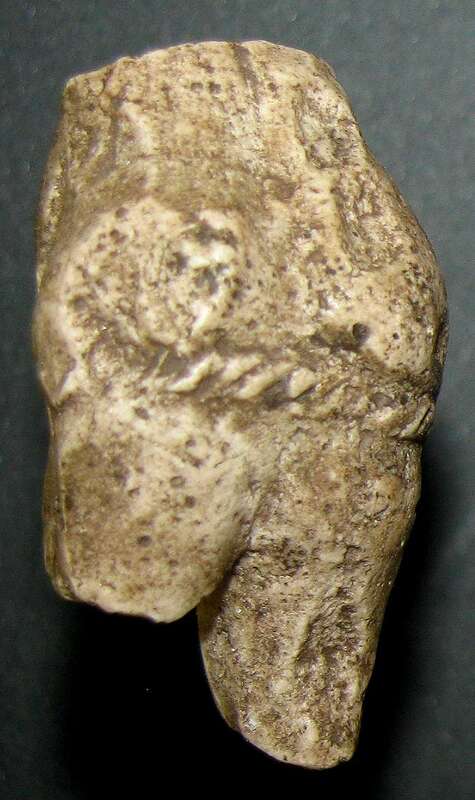 This appears to be a museum facsimile of the venus known as the Venus of Predmost. It is wonderful to have such a high quality photograph of this important work. 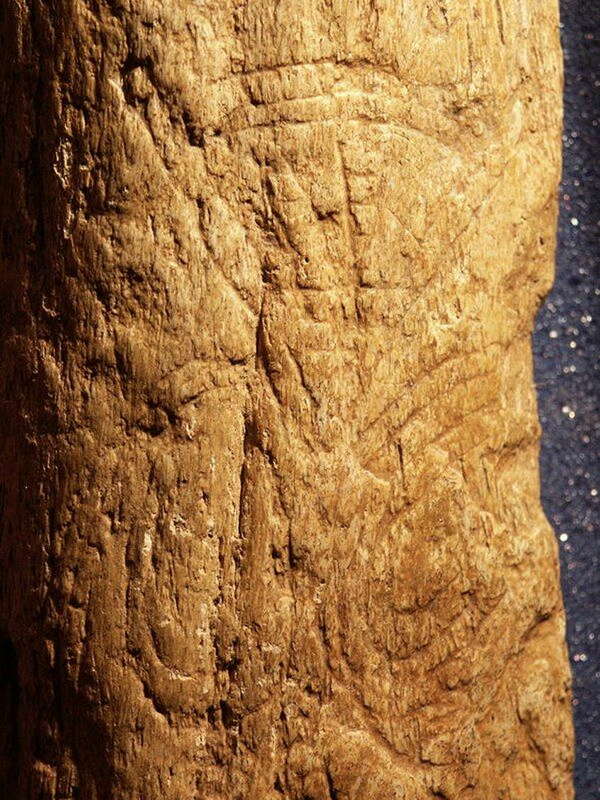 This appears to be a facsimile of the Predmost tusk, but it has been very well done, and is by far the clearest image of the carving I have seen. This is another artefact from Predmost, with a design almost identical to that carved on the tusk above. 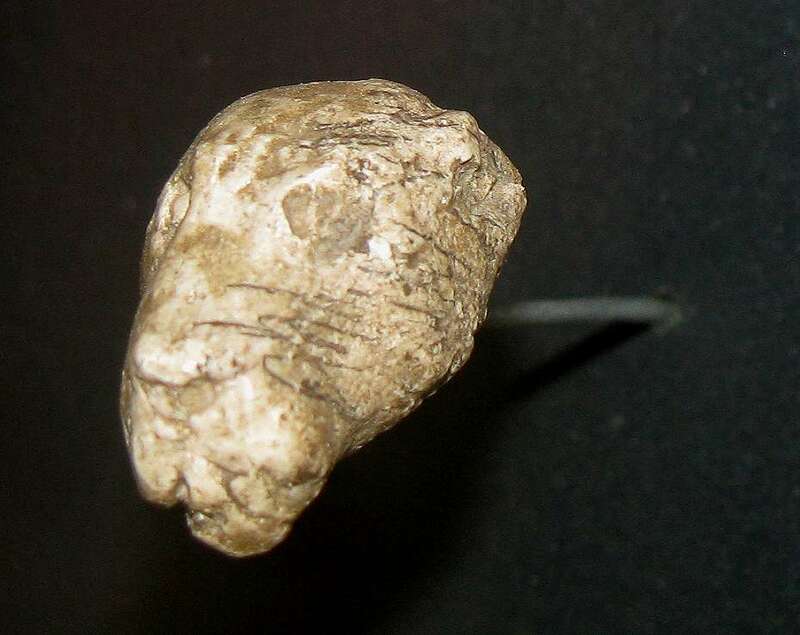 One Gravettian feminine representation - the schematic Venus of Predmostí - is so different from all the others that it has always been regarded as unique. The engraving, which was closely examined for the purpose of comparison in this study, represents a woman composed of geometric shapes, including a triangular head with interior lattice-work, concentric ellipses for the breasts, belly and pelvis, a double ladder for the remaining arm, hatch marks, and a thigh made up of parallel vertical lines. 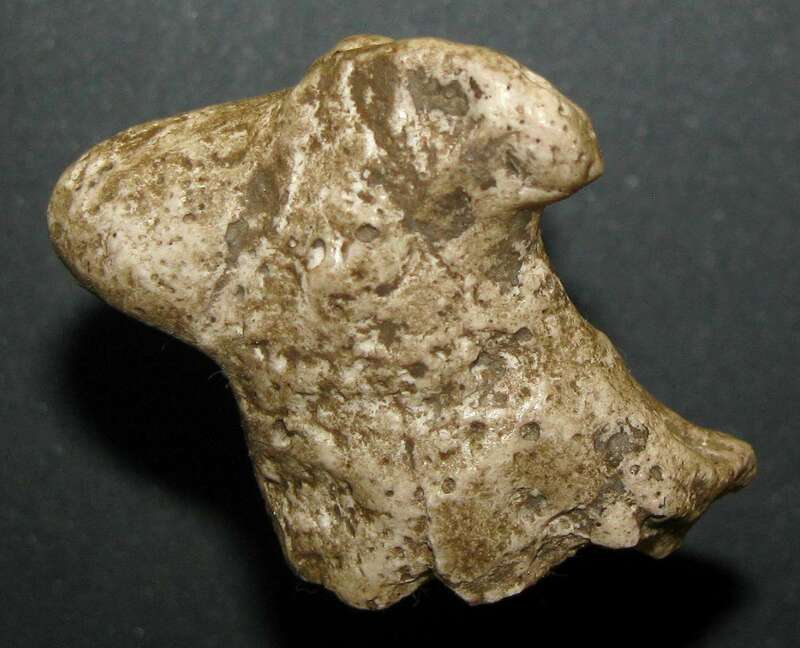 This article presents the discovery and discusses the authenticity of a second, feminine anthropomorph engraved on a bone shaft fragment, which is labelled as coming from the same site and is highly similar to the one described at the end of the nineteenth century. 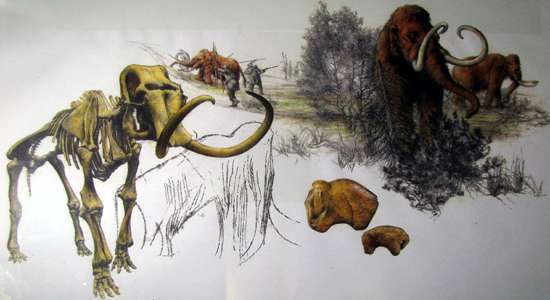 The modern history of Predmostí reveals that the site was used as a quarry for the extraction of loess and limestone, and that tons of mammoth bones were extracted to produce spodium (burned bone usually used for medical purposes - Don ). 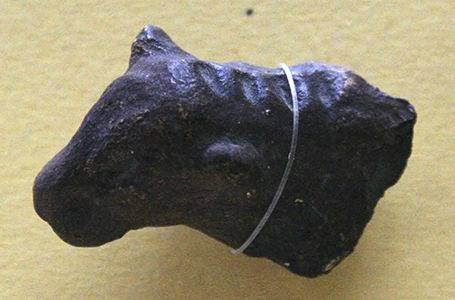 Remarkable objects that were found both during early archaeological excavations and the site’s commercial exploitation went towards private collections. The history of the piece under study traces it back through a succession of owners to the collection of René de Poilloüe de Saint-Périer (b.1877 - d.1950) and Raymonde-Suzanne de Saint-Périer (b.1890 - d.1978). 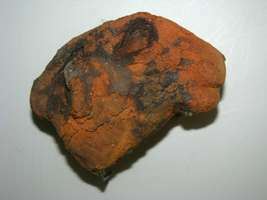 5) some abrasion, which resulted in the creation of a few straight lines. 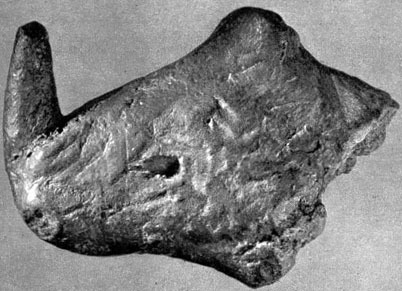 Since no evidence is found to suggest that the highly worn appearance of the engravings composing the feminine representation resulted from modi!cations that were meant to arti!cially age the periosteal surface of the bone, we conclude that the engraving can be plausibly attributed to the Gravettian and that further analyses are warranted. 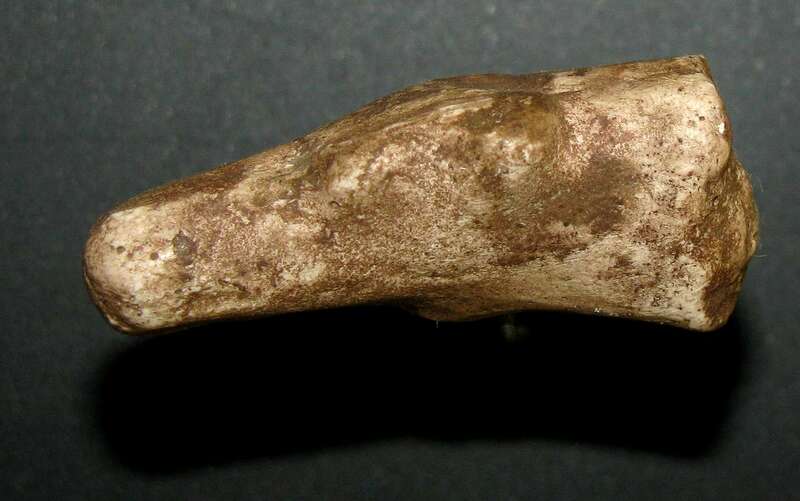 Close up of the bone above. This photo appears to be of the original. The support on which the engraving was made is 174 mm long, 70 mm wide, and 30.7 mm deep. 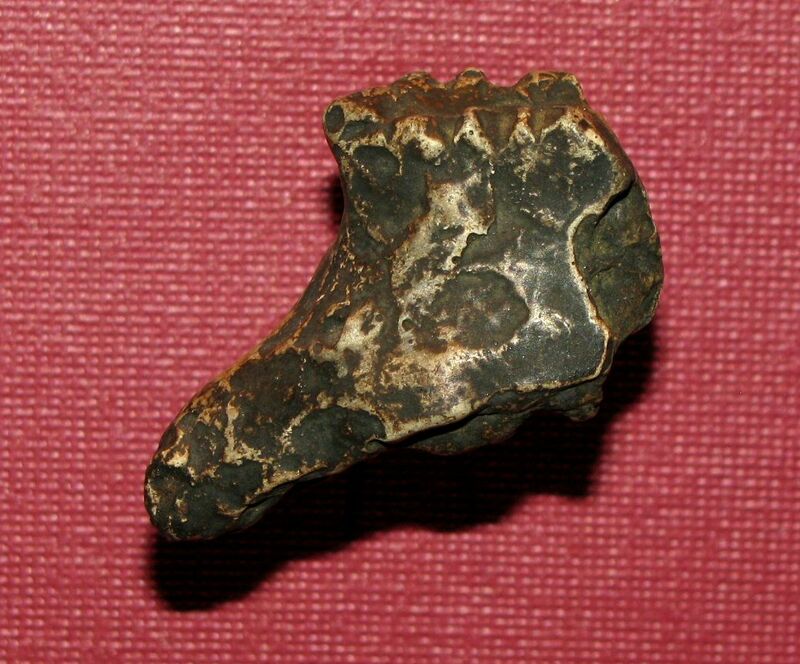 It is a fragment of a long bone from an extremely large, class 5 mammal. Because of the thickness of the compact bone (approx. 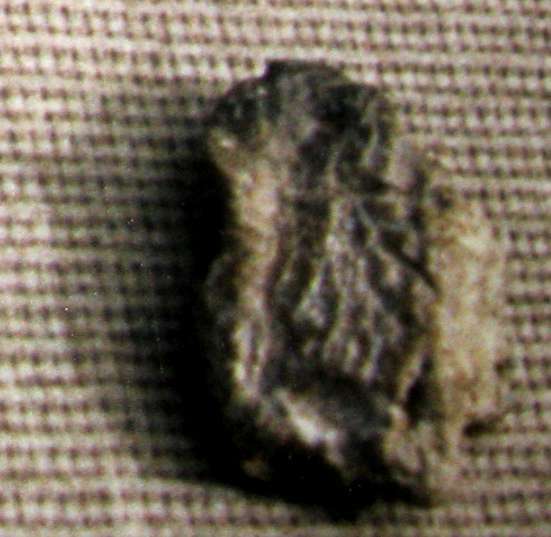 30 mm), its fibrous aspect, and remnants of spongy bone in a diaphyseal zone, we attribute the fragment to a proboscidian. 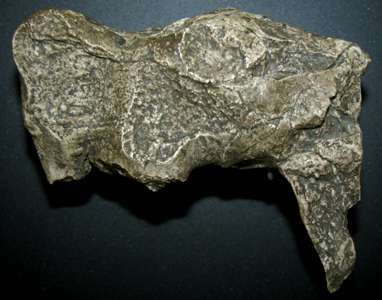 The morphology and, in particular, the cross - section of the periosteal surface indicates that it is probably a femoral fragment. 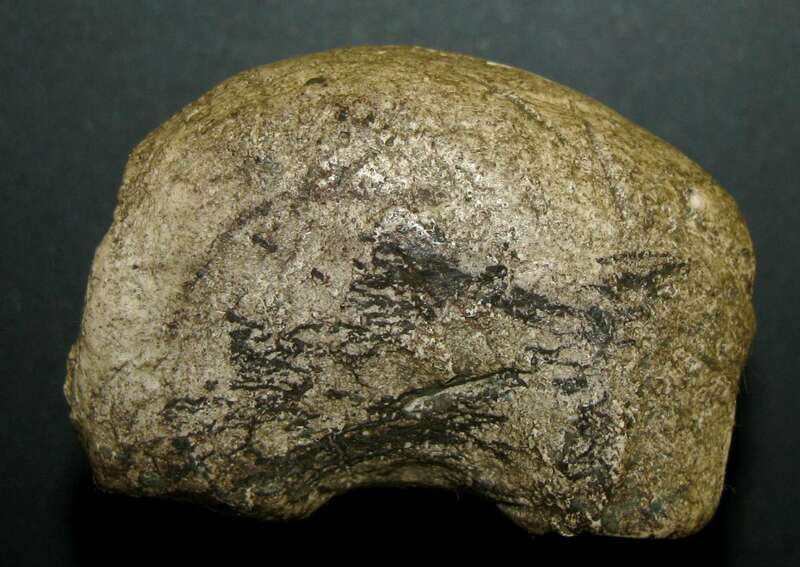 The compact texture of the bone on the periosteal face seems to indicate that it came from an adult animal. (left) Close up of the design on the bone. (right) Tracing of the design on the bone. The two designs are so similar, they may well be by the same artist. The possible 'twin sister' of the 'Venus of Predmosti' is owned by U.S. art collector Duncan Caldwell. 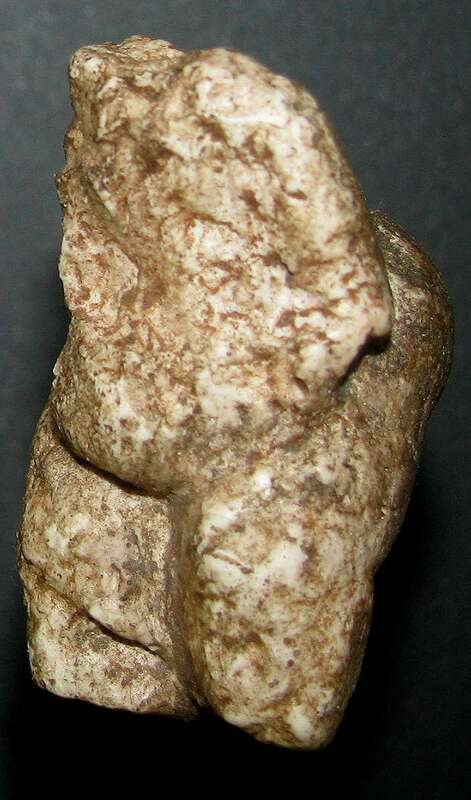 Another version of the Venus of Predmost. 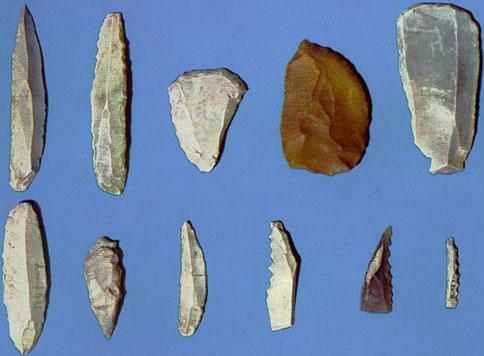 The flints and quartz tools were re-created originals, and were certainly not facsimiles. The reproduction spears, meant for throwing, given the fletching of feathers, are much thicker than I would have expected. 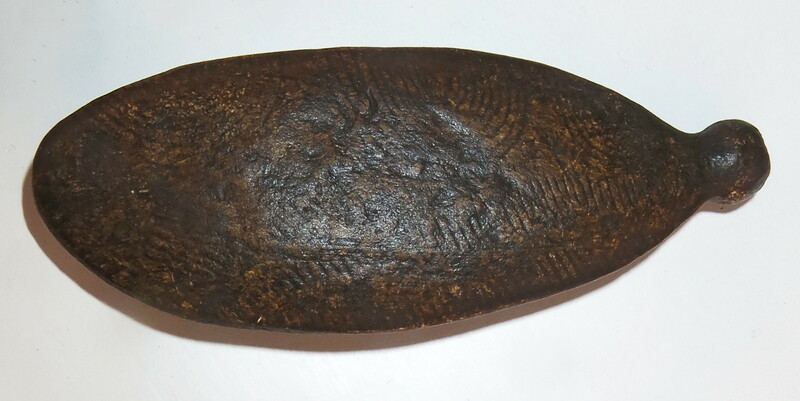 If they were to be thrown using a spear thrower or atlatl, they would normally be much thinner and lighter than this. Hammer stones, hand axes, and blades, made of flint. These crystal clear quartz tools would have been highly prized for their workability and beauty. They are extremely difficult to photograph. Later flint knappers were able to make exquisite tools from this material, as techniques improved. 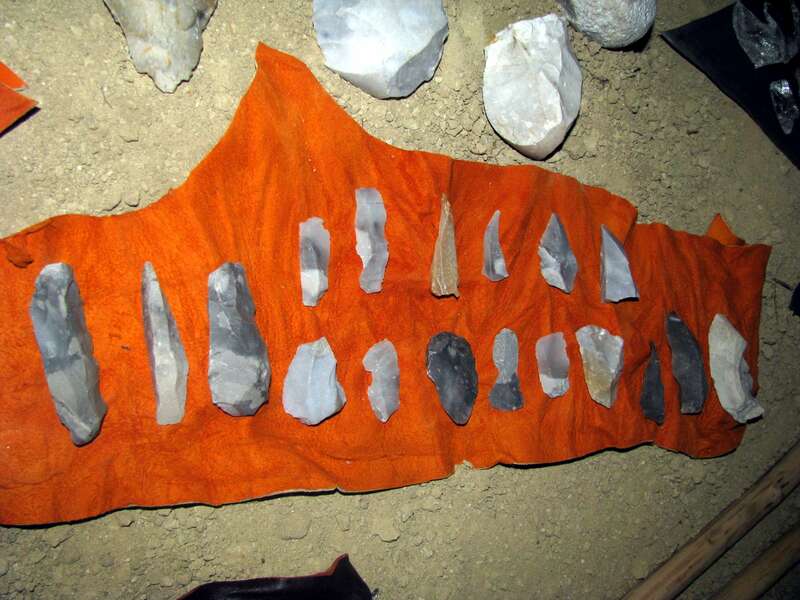 A fine array of Gravettian flint blades, very well made. I am uncertain of the purpose of this large object. The simplicity and regularity of the incisions make me think that it may have been a record of something, perhaps days of a cycle such as the moon. There are 24 incisions in the bottom row, 24 (some appear doubled) in the middle row, and 17 visible in the top row of this photograph. This antler seems to have some minimalist carvings on it, and has been sharpened to a flat point at one end. It may have been used to dig post holes for huts. This antler also seems to have some minimalist carvings on it, and has been sharpened to make it suitable as a pick for digging in the earth. 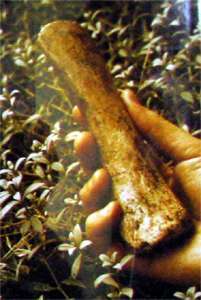 These two bones or pieces of antler appear to have been carefully shaped for some purpose. 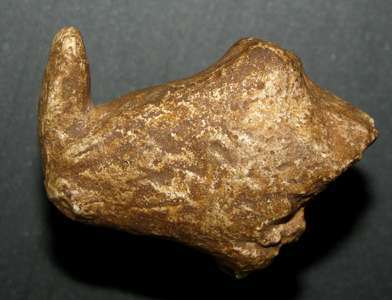 The right hand end of the larger has had a U shape carved out of it, which I find puzzling, but it is like a modern spade handle without the cross piece for the hand. Certainly the larger bone has been shaped like a spade at one end. 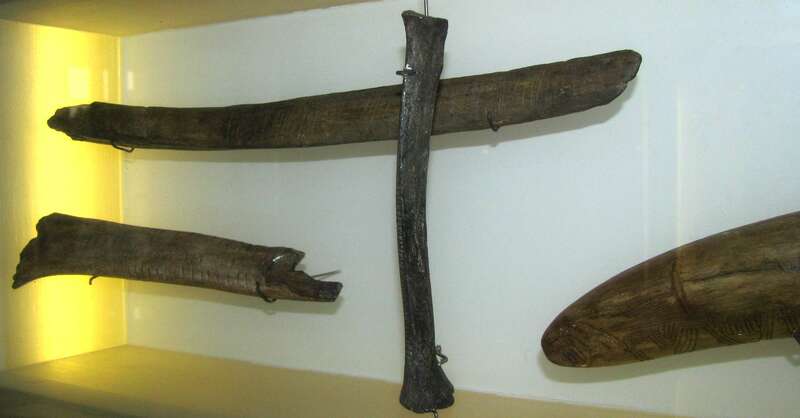 However the juxtaposition of the smaller piece of bone/antler in the display case makes it appear that it is perhaps a mallet for hitting the larger at the U shaped depression, possibly to hammer the spade into hard earth. 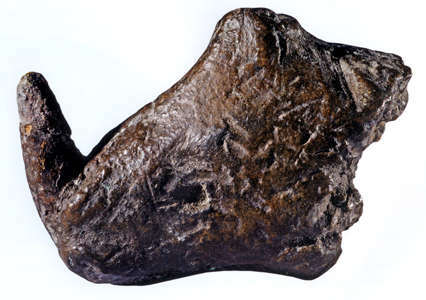 This spade has had a large number of chevrons carved into its surface as decoration. 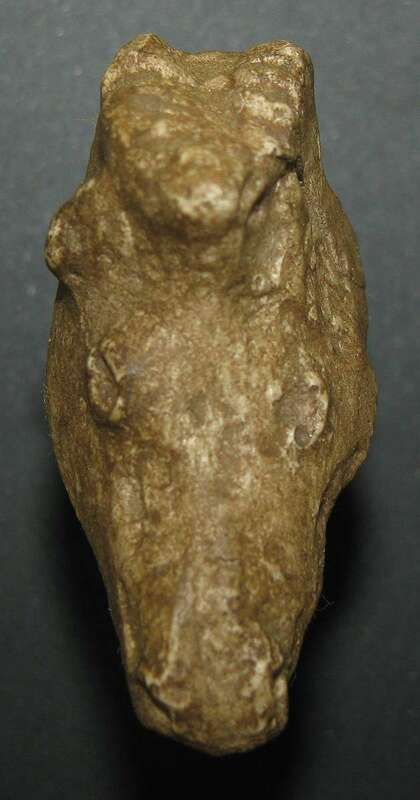 Closeup of the head of the spade above. Closeup of the handle of the spade above. 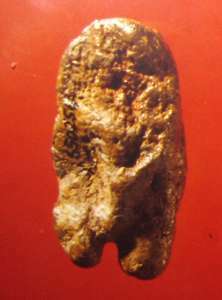 This spade seems to have been strictly utilitarian, although there are traces of what may have been a decoration on the right hand end. Perhaps it was originally decorated, but has seen hard use. All four tools in the display case, to give some idea of relative sizes. Bone awls. Some of these appear to be originals. 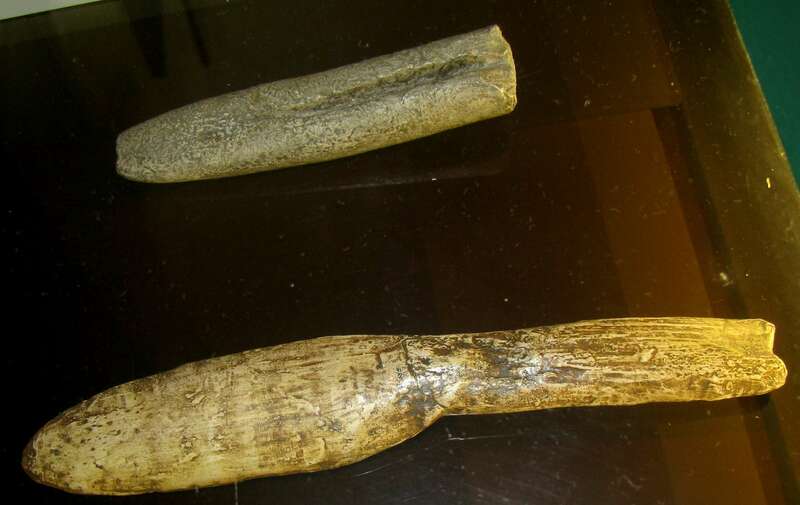 Apparently a spike carved from a mammoth tusk. It may have formed the end of a killing spear for mammoths, when trapped against the rock wall of the neighbouring limestone cliffs. Two tools, one of enigmatic use, the other apparently a trowel like object. 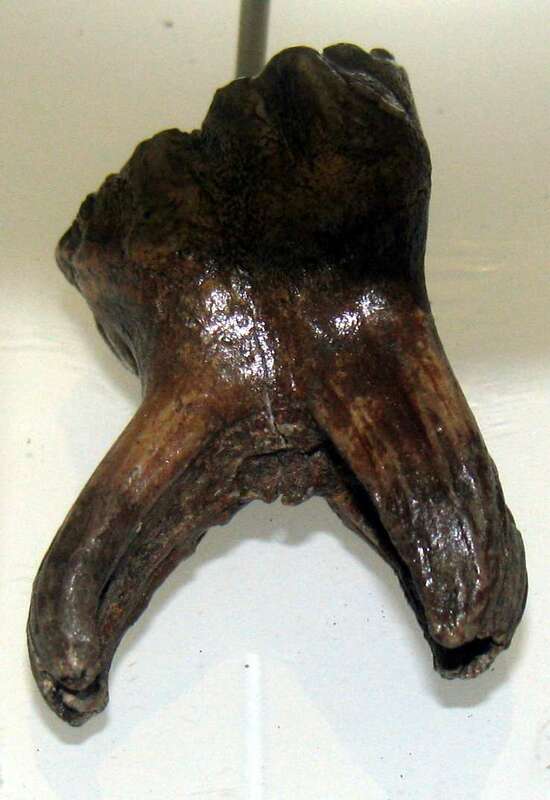 Young Mammoth tooth. 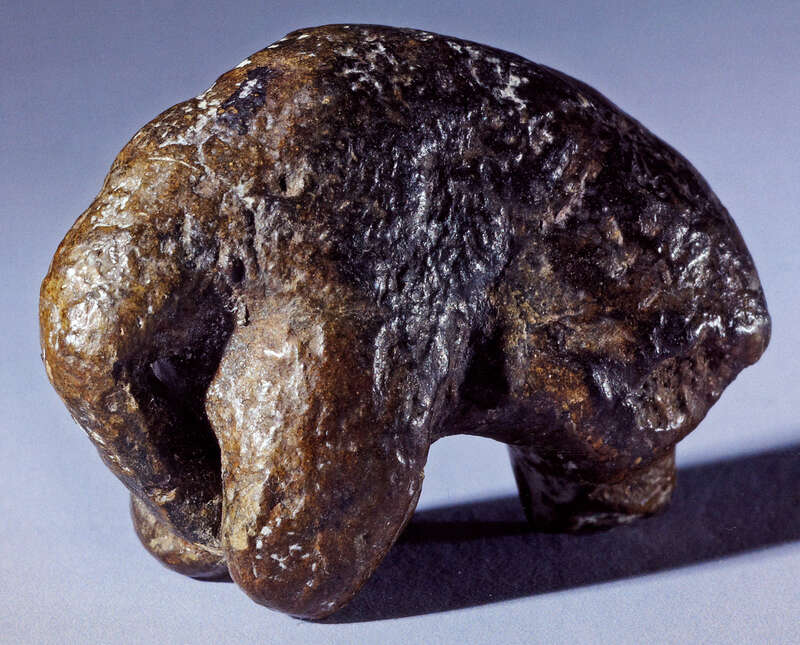 This is graphic evidence that the people of Dolni Vestonice were opportunistic hunters, and chose this juvenile mammoth presumably for its tender flesh and ease of capture. Mollusc shells. I am unsure of the reason for these shells being in the deposits, but perhaps they were for jewellery. They may be fresh water specimens obtained from the nearby Dyje River. 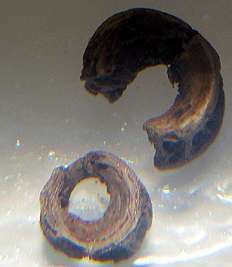 Fish vertebrae. 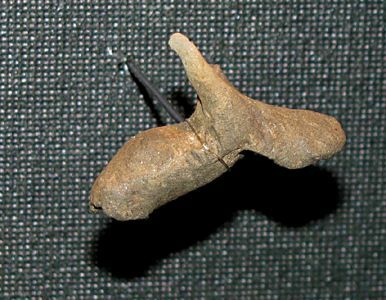 The hunters must have had traps or harpoons to catch the fish in the Dyje River. Stylised female figurine used as a pendant, height 8.6 cm, made from mammoth ivory. 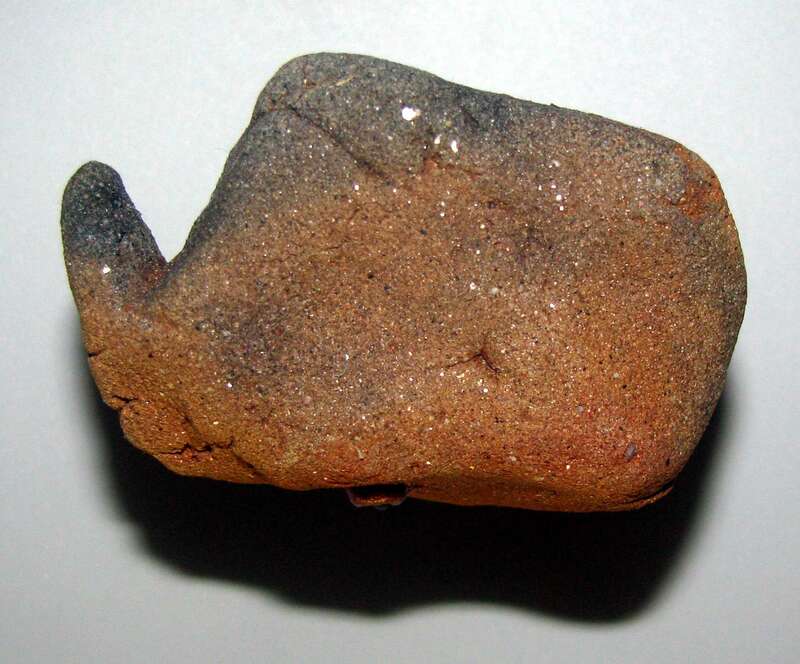 More than 2 000 shards of burnt clay, ceramic figures and fragments have been found during the excavations conducted in Dolni Vestonice. 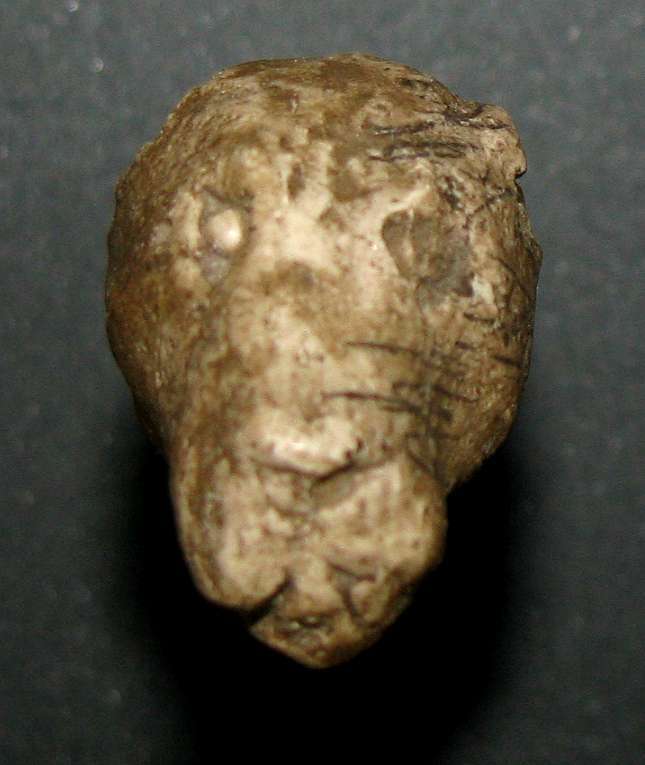 The extant ceramic figures are mostly zoomorphic: bear (7.5 cm), bear head (4.7 cm), rhinoceros head (4.2 cm), lioness head (4.5 cm), horse head (8 cm), reindeer head (3.8 cm) and two miniature mammoth figures. 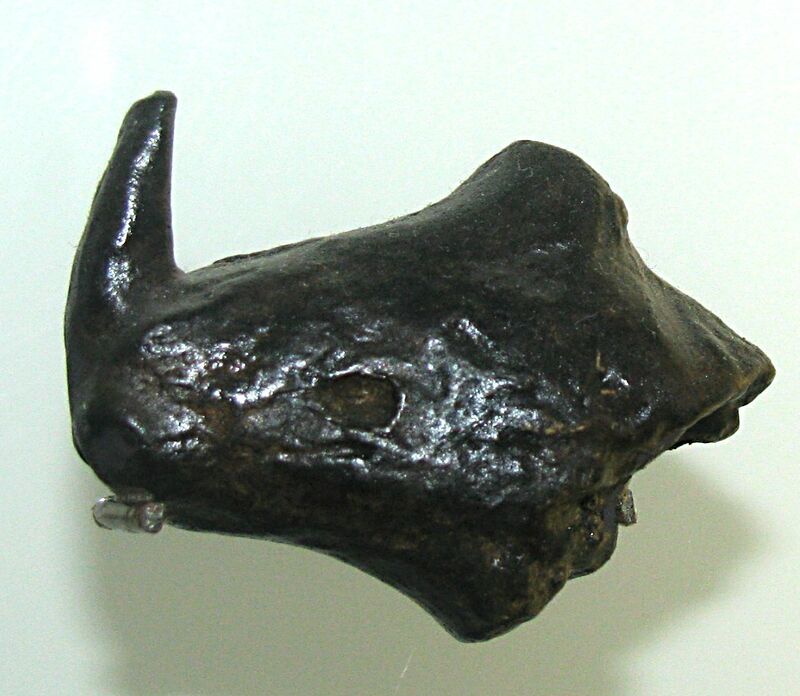 Rhino head from Dolni Vestonice. A beautifully realised image by the artist Zdeněk Burian. The potter is making some of the zoomorphic figures also found at the site outside the small, simply constructed tent found near the ceramic figurines. Close inspection of the painting shows that this image depicts a male as the potter, whereas it is now believed that the woman who created the Dolní Věstonice venus also created the figurines. Dolní Věstonice, called Unterwisternitz at the time of the Austro-Hungarian Empire, and during WWII when it was incorporated into Nazi Germany, has an excellent museum with high quality reproductions of many of the famous objects found at Dolní Věstonice or at nearby Pavlov (called Pollau in German) and other sites in the area. Photo by Aleš Soldán, at Panoramio from Google Earth. The ticket to the museum is no ordinary ticket! It is a work of art all by itself. 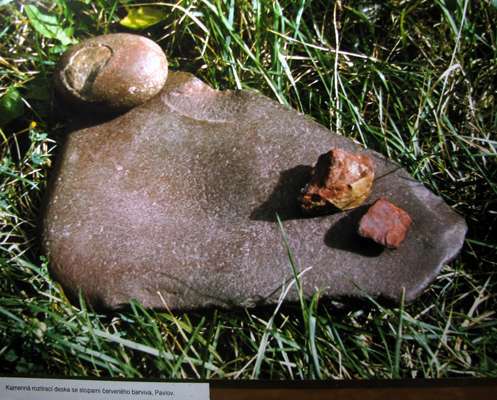 However, I believe that those on display at the Dolni Vestonice Museum are museum quality casts, superbly crafted and hand coloured, apart from the posters of what look like originals, with a red background, as shown in the first four photographs. I found some originals, however, in the Vienna Natural History Museum, which appear below. 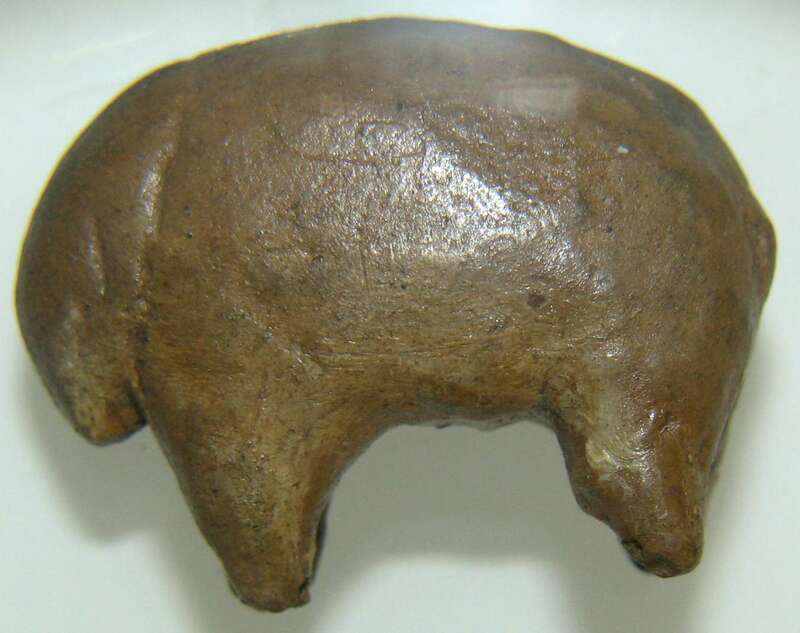 Which translates as: Mammoth from Pavlov in Moravia, 25 - 27 000 BP, ceramic, original held in the collections of the Vienna Natural History Museum. 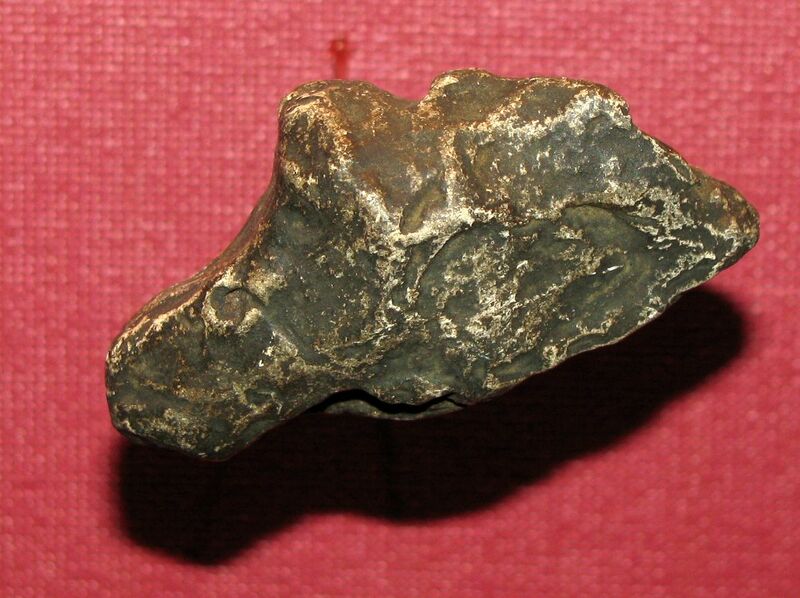 Mammoth, the other side of the mammoth pottery figure above. This is the find that led to the discovery of the world famous site of Dolni Vestonice. Zoomorphic pottery figurine, possibly a mammoth. Two different facsimiles of the original above. 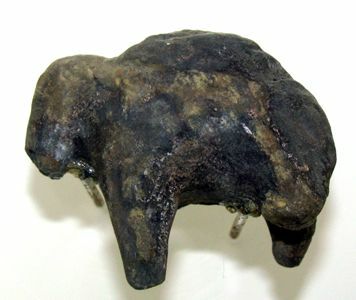 Which translates as: Mammoth from Dolní Věstonice in Moravia, 25 - 27 000 BP, ceramic, facsimile on loan from the Archaeological Institute of the Academy of Sciences, Dolní Věstonice. 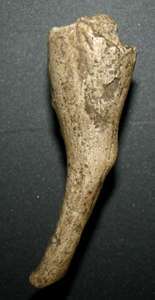 Which translates as: Owl from Pavlov in Moravia, 25 - 27 000 BP, ceramic, original held in the collections of the Vienna Natural History Museum. Which translates as: Saiga Antelope from Wachtberg bei Krems in lower Austria, 27 000 BP, ceramic, original, on loan from the Academy of Sciences, Vienna. This is a very important piece, as it shows that the pottery created in Dolni Vestonice was carried or traded at least 100 kilometres from where it was made. Which translates as: Rhinoceros head from Dolní Věstonice in Moravia, 25 - 27 000 BP, ceramic, facsimile on loan from the Archaeological Institute of the Academy of Sciences, Dolní Věstonice. 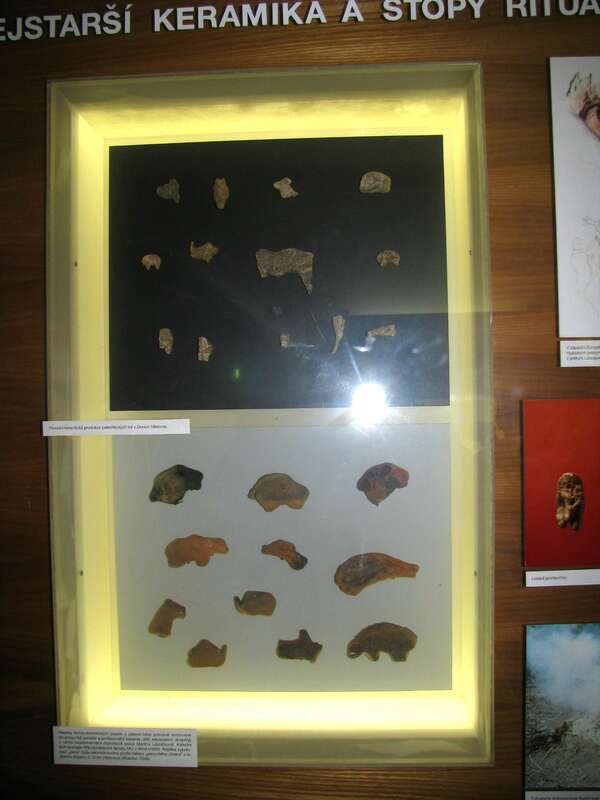 Copies, left from the Vienna Natural History Museum, right from the display at the Dolní Věstonice museum, of the same original. 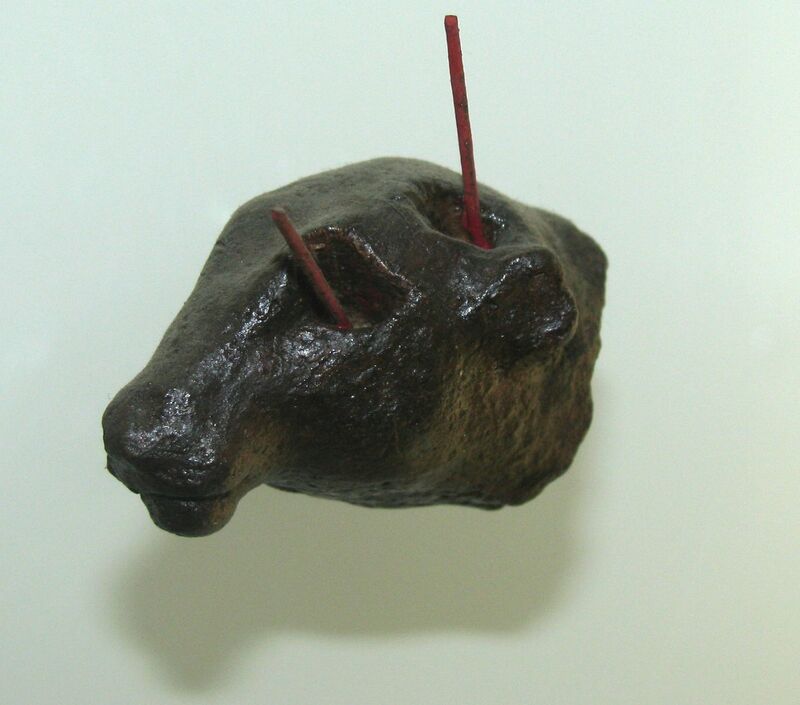 Young bovid in fired clay. Which translates as: Reindeer head from Dolní Věstonice in Moravia, 25 - 27 000 BP, ceramic, facsimile on loan from the Archaeological Institute of the Academy of Sciences, Dolní Věstonice. The Reindeer head above seems to be of the same original as this copy in the Dolní Věstonice Museum. This appears to be a member of the weasel family, possibly a mink. 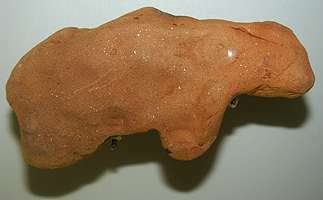 Young mammoth, baked clay. From Dolni Vestonice. Mammoth. This figure has been created as a bas relief sculpture, rather than as a full three dimensional representation. 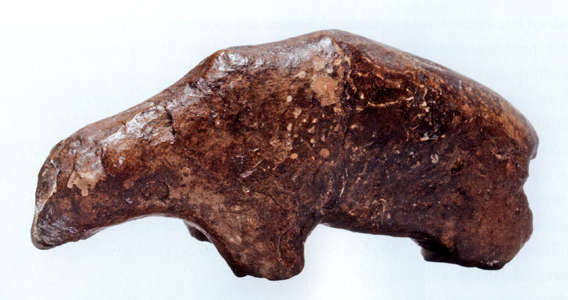 The body, the legs, the trunk and distinctive head have been shown, but not tusks. This enigmatic figure, possible a feline, seems to have been made so that it could be worn as a pendant, with an artificial groove at one end for attaching a cord. 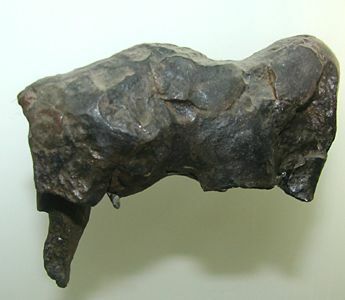 Bear from Dolni Vestonice. Ceramic. Height 32 mm, length 75 mm. 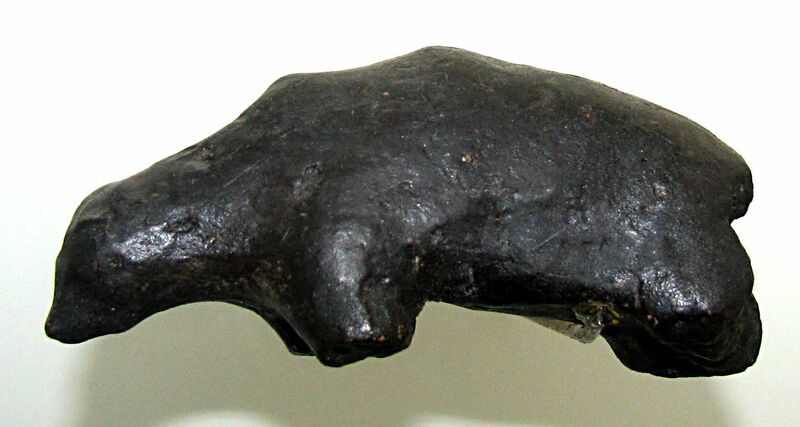 Bear, facsimile of the original above. Most likely a mammoth with the trunk broken off either during firing or later. Pottery head of a lioness. This is a famous piece, 4.5 cm long. 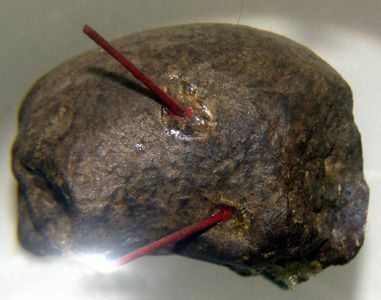 The facsimile on the right has been mounted using oversized red rods to show that there is a hole right through the figure at two places, at the eye, and just above the ear. 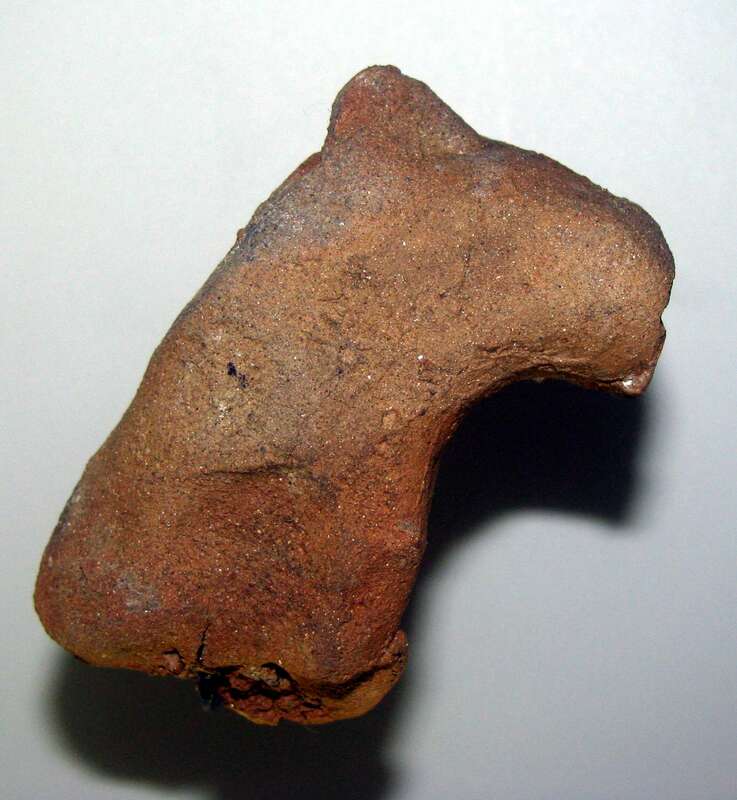 Zoomorphic pottery figurine, possibly an Ibex. 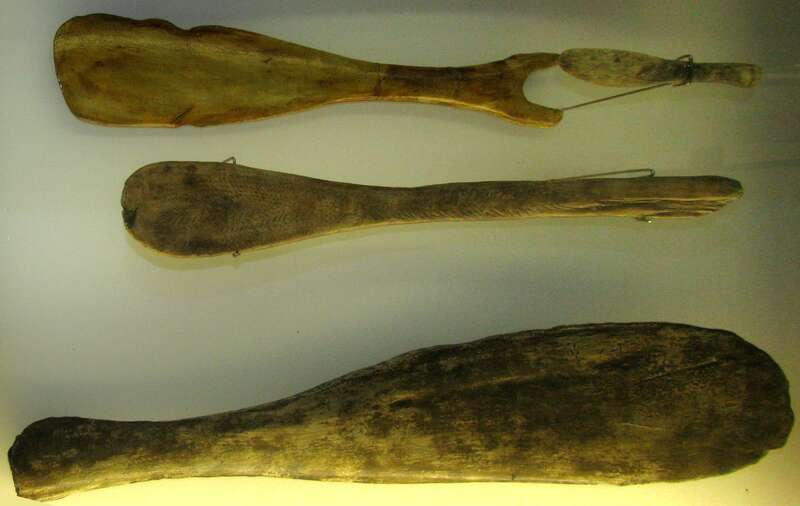 These were different facsimiles in the Dolní Věstonice Museum, but apparently of the same original. 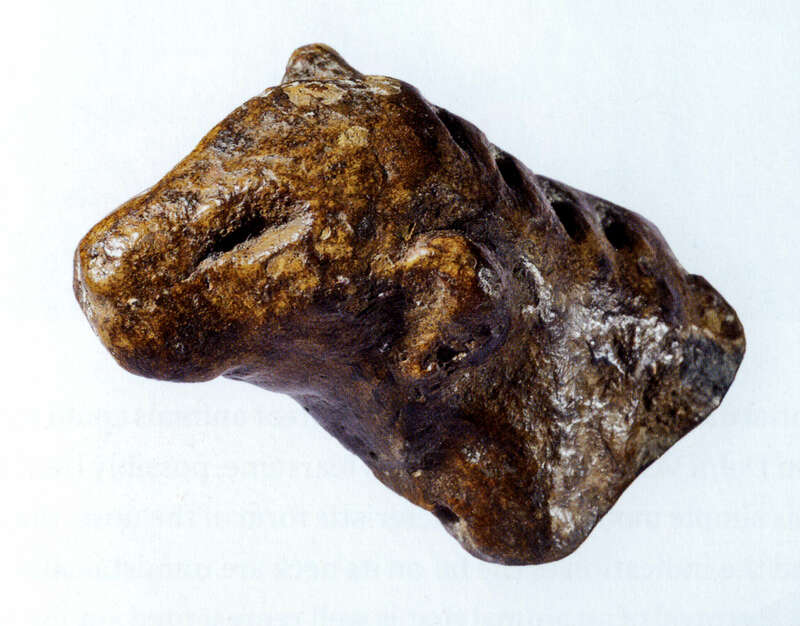 Lion heads from Dolni Vestonice. Ceramic. Height (left) 28 mm, height (right) 20 mm. 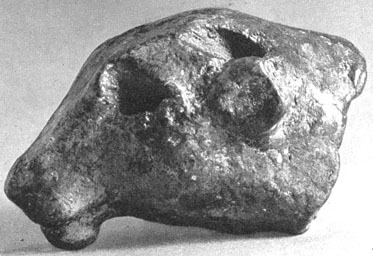 Lion heads from Dolni Vestonice. 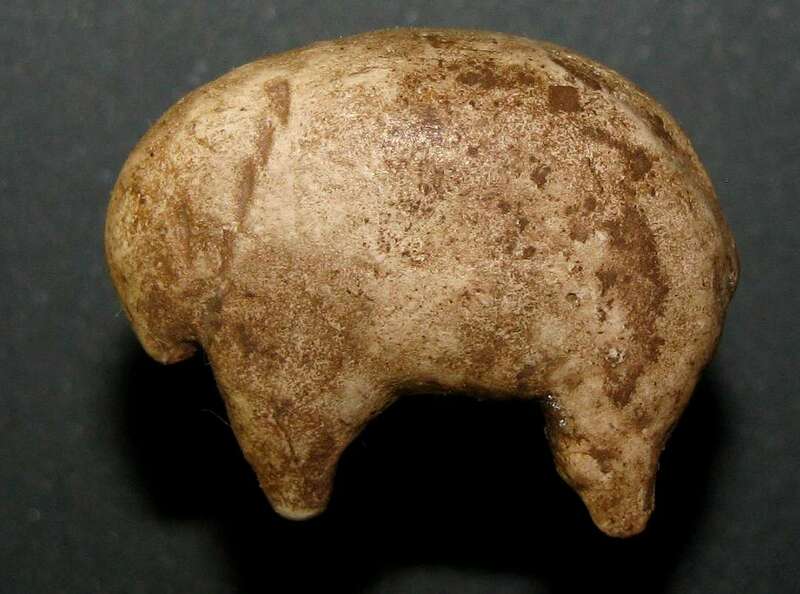 This looks for all the world like the head of a bear cub. 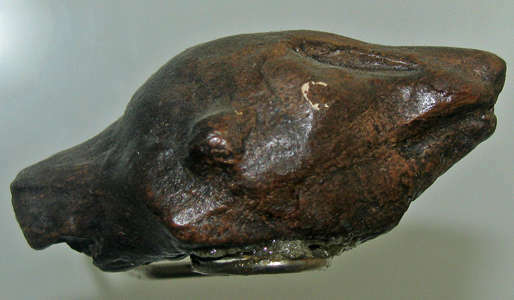 Rhinoceros head, 42 mm. This is a very well known piece. This is identified as a horse's head. Horse head from Dolni Vestonice. This is identified as a reindeer on the display. The black, circular depression just above what appear to be prominent jaw bones beneath the head puzzles me, unless it was another hole to indicate where to strike the animal when hunting, or to indicate some other purpose entirely. 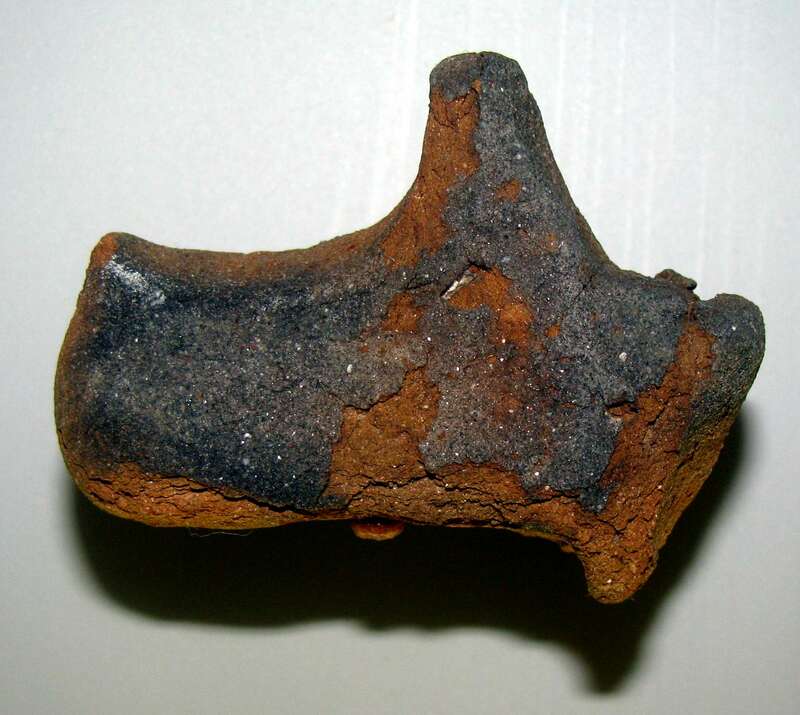 Zoomorphic pottery figurine, apparently the other side of the reindeer head above, cast from the same original. Head of a bear, with the mouth pointing to the right. 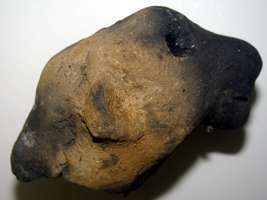 Once again there is a large circular depression, this time on the top of the head, possibly to indicate a stab wound. 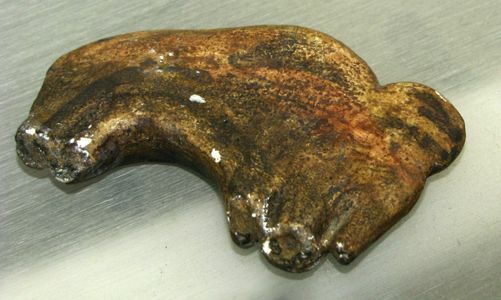 This is identified on the display as a bear's body with stab wounds. It is a very small object under a large magnifying glass. 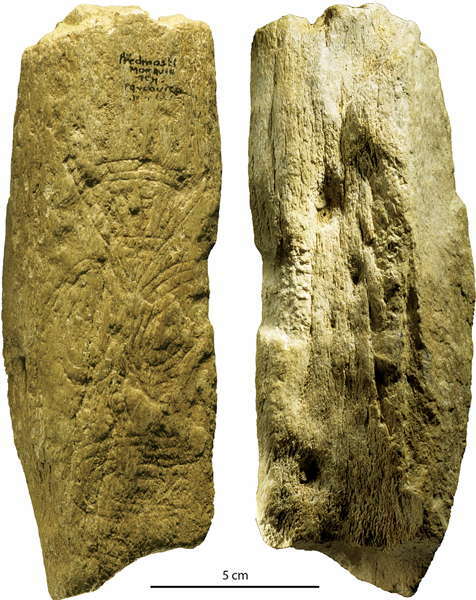 Facsimiles of a zoomorphic pottery figurine, a mammoth, and a poster of the original. The mammoth was damaged in the kiln because of sudden temperature changes. Some have speculated that this was sometimes deliberate, for spiritual or magical purposes. Another superb image by the artist Zdeněk Burian. Here the completed but undried figures are being flung into a fire by a shaman so that they explode, for ritualistic purposes. This is a wonderfully realised scene of the planned destruction of the images for a particular magic purpose. Posters of zoomorphic pottery figurines. Posters of anthropomorphic pottery figurines. 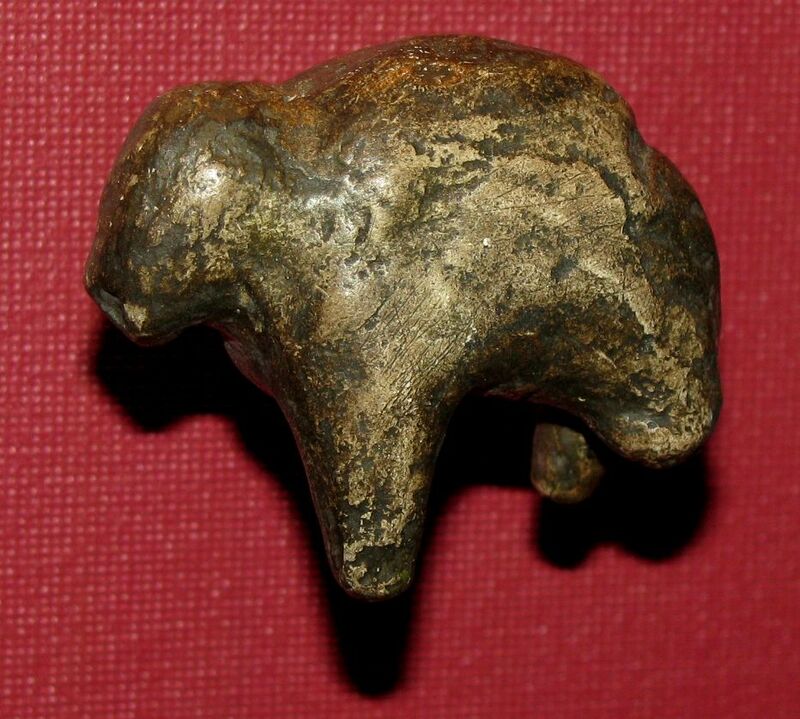 Zoomorphic pottery figurine, possibly a mammoth. 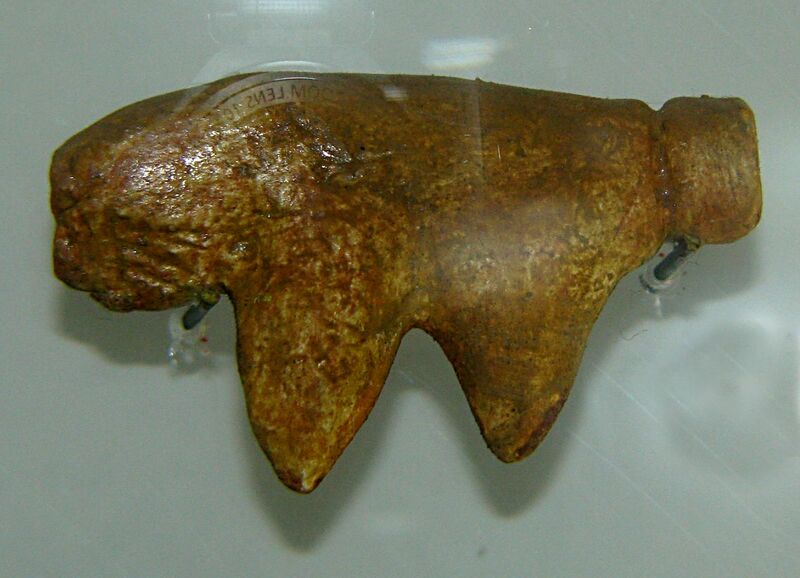 Mammoths were very important in the life of the people of Dolni Vestonice. It is believed that he hunters used the rugged terrain at the foot of the Pavlov Hills, which formed a sort of natural trap. 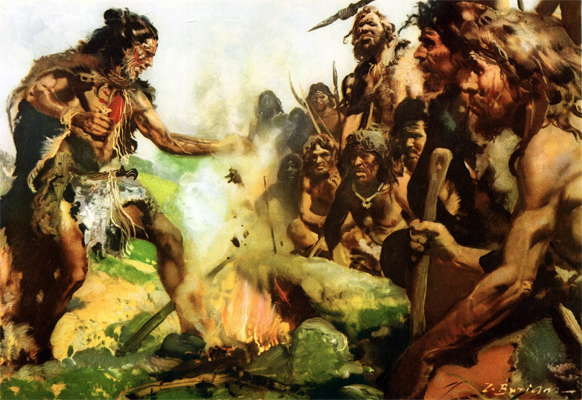 The hunters separated the mammoth from the herd, and forced it against the steep slope, where the hunters were able to charge at it with spears, and bring it down. Anthropomorphic pottery figurines. The one on the left appears to have a twisted cord or cloth around the waist or buttocks. Zoomorphic pottery figurine. Possibly a feline. 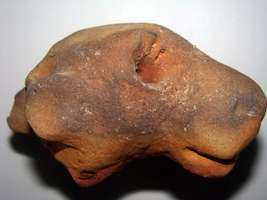 Zoomorphic pottery figurine. 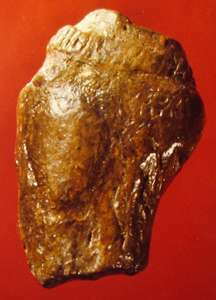 Leg broken off a larger figure. When I first saw these I could not believe my luck. So far as I could tell they were originals, not replicas. "Modern museum quality facsimiles are staggeringly good. 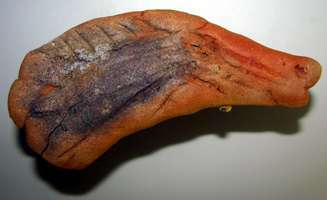 In particular the casts are hand coloured to exactly match the original, and the casting itself is absolutely superb. I would love to have those skills. 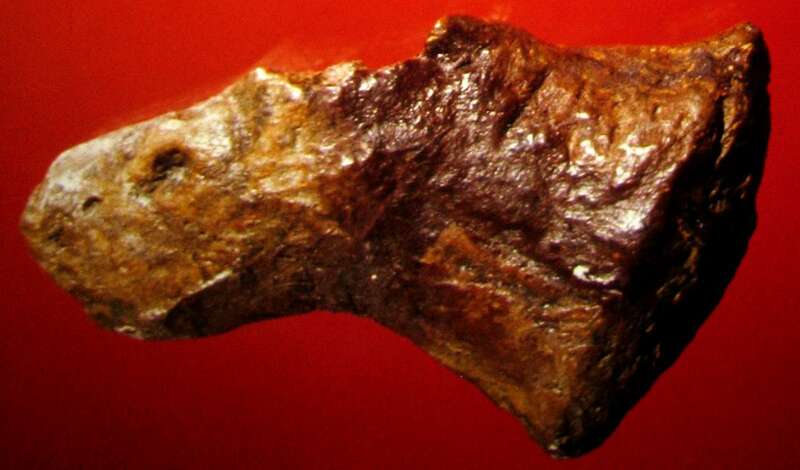 The only thing that gives them away is the fairly uniform surface texture and patina, and the way they reflect light, as well as the lack of extremely fine detail such as hair line fractures and similar "flaws" inherent in an object tens of thousands of years old. " These had the marks of originals, the lack of uniformity of material, cracks impossible to duplicate by casting. Later, at home in Australia, I looked at my photographs again very carefully at maximum magnification and concluded that they were original ceramics - but they were unlikely to be the originals from Dolní Věstonice in a building supervised by one woman seated at the computer in a small ticket office just inside the front door of the museum. I decided then that they were recreations, real pottery figurines made as close as possible to the originals, and fired in the same way. This would explain the incredible detail in the figurines, and the superb surface texture, quite different to even a museum quality casting. 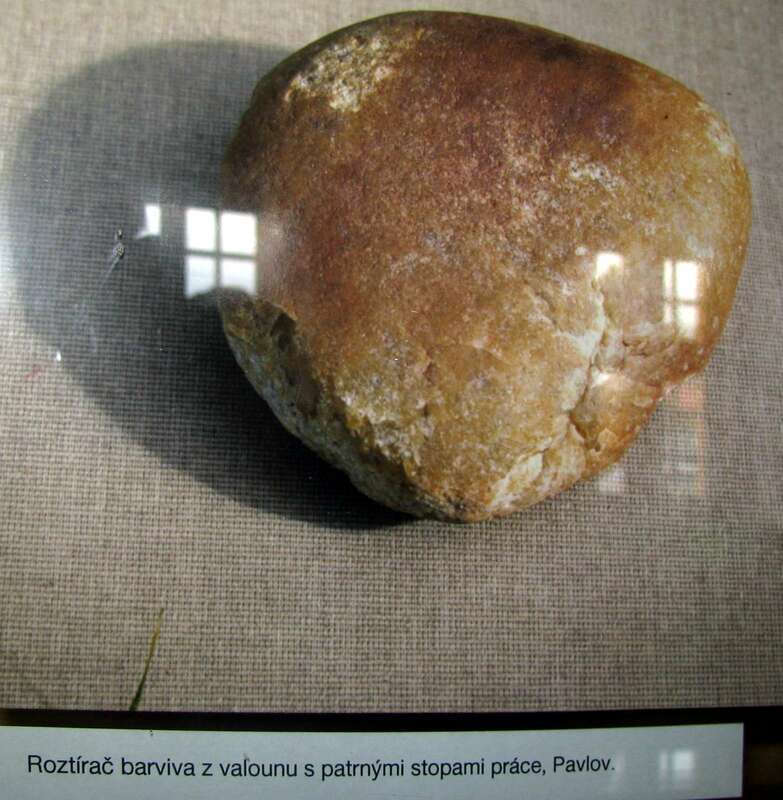 Then, I came to this notice in Czech in my photograph of the display case, and translated it. It was much as I had suspected. What a wonderful project by Martina Lázníčková! Replicas of Dolní Věstonice fired clay sculptures made by an experimental group of people (amateur and professional ceramicists, children, adolescents, adults) in the experimental thesis of Martina Lázničkové, Department of Anthropology Plirodovedecke MY faculty in Brno (1995). 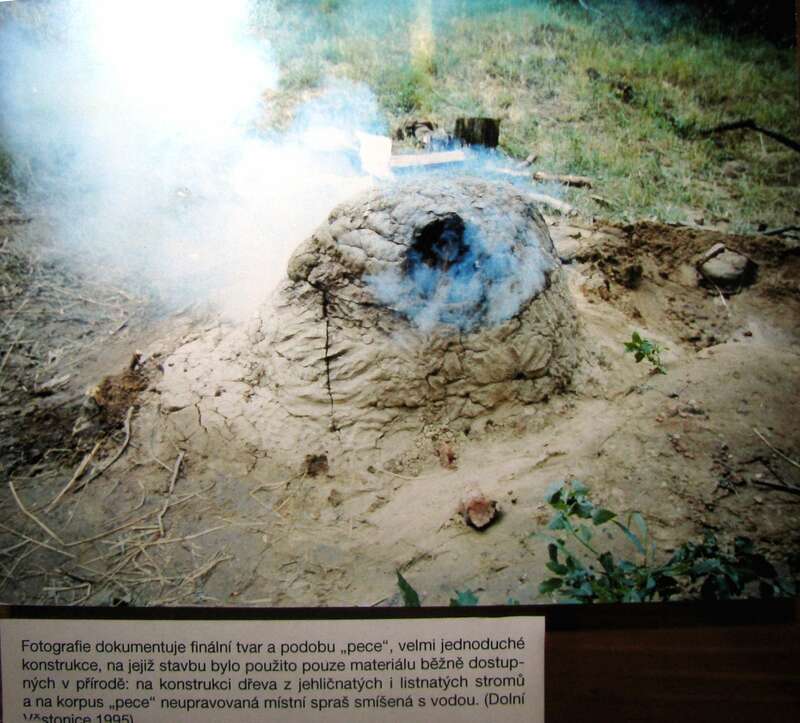 A replica pottery kiln was reconstructed by using the dimensions and similar materials to the original kiln found at Dolní Věstonice by Absolon in 1926. Photograph of the kiln in use, firing the pottery figurines shown below. 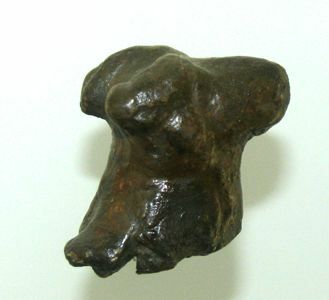 This documents its final shape and form. It was a very simple structure, which was fired with wood gathered locally from coniferous and deciduous trees. The kiln was made from locally sourced loess clay mixed with water. 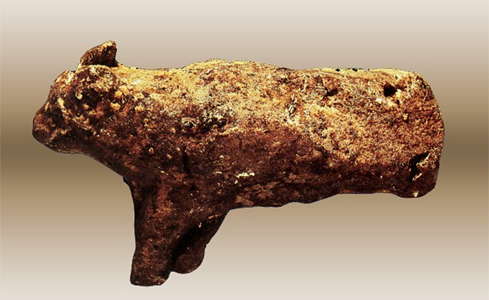 Zoomorphic pottery figurine. Possibly a bear. 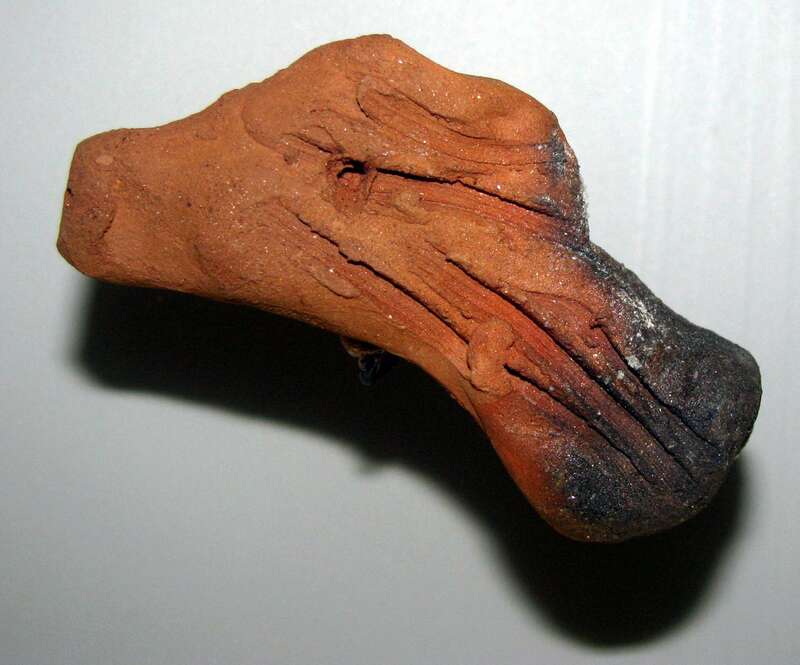 Zoomorphic pottery figurine of a horse head. 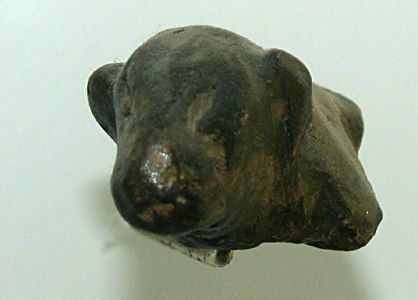 Zoomorphic pottery figurine, possibly of a feline. 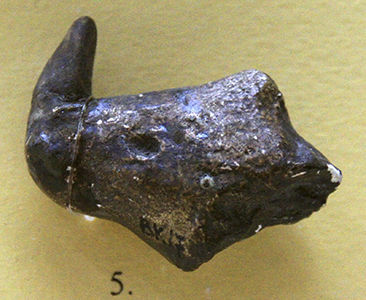 Zoomorphic pottery figurines of rhinoceros. Zoomorphic pottery figurine of a rhinoceros. 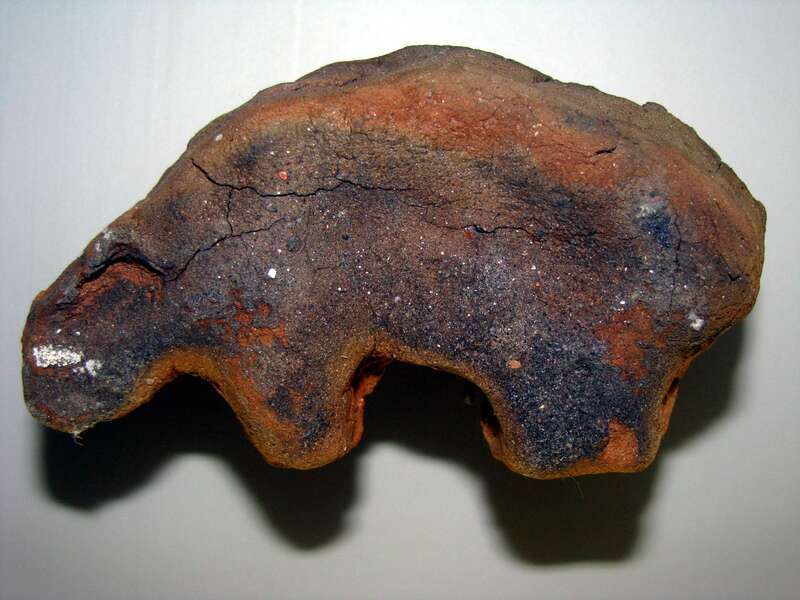 Zoomorphic pottery figurine of a bear. 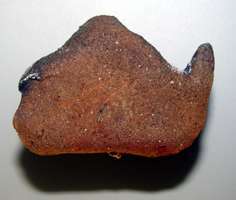 Cobblestone mortar with evident traces of use for grinding ochre, Pavlov. Well turned and finished stone disk, unknown purpose, Pavlov. 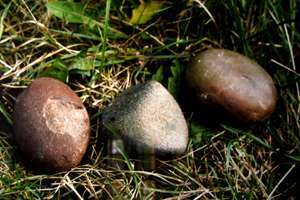 Grindstones and mullers made from river cobbles, Pavlov. 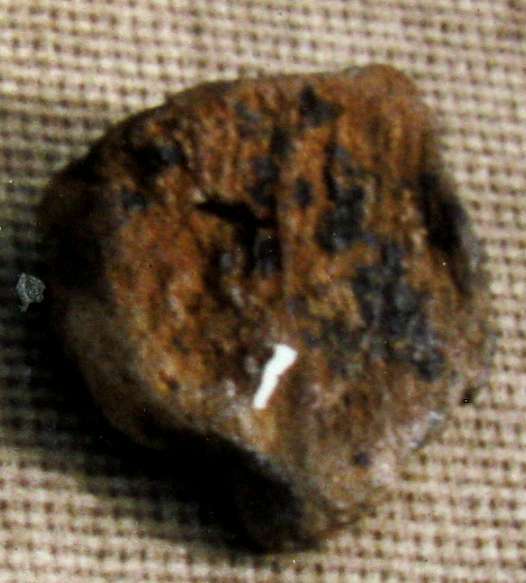 Stones showing traces of use. 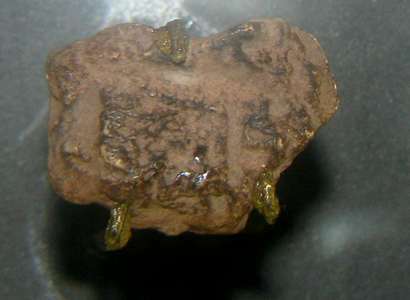 Ceramic pellets with textile impressions. 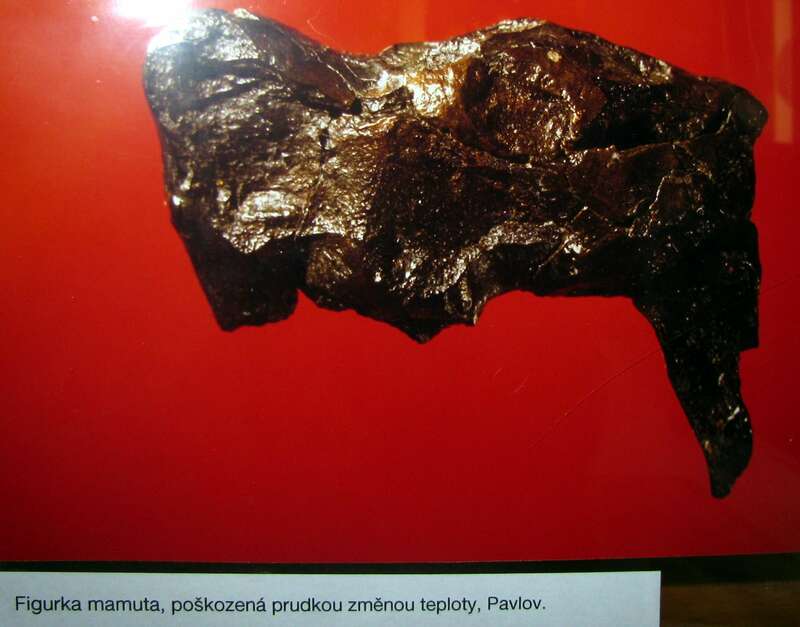 In July 1996 it was shown that the ceramic fragments from Pavlov had preserved the oldest known preserved imprints of textiles in the world. To enable people to use this technology, there had to be a sufficiently stable living area, and they needed to be very familiar with their surroundings. They probably used nettles for thread fibres, and if they were able to spin and weave thread and textiles, they undoubtedly had related skills such as basket weaving, making fish and animal nets, and traps. The ethnographic observation is clear that the treatment of organic materials could well be more important in their daily life than we usually conclude from the better preserved stone and bone. Additionally, it provides information about an activity probably attributable exclusively to women. 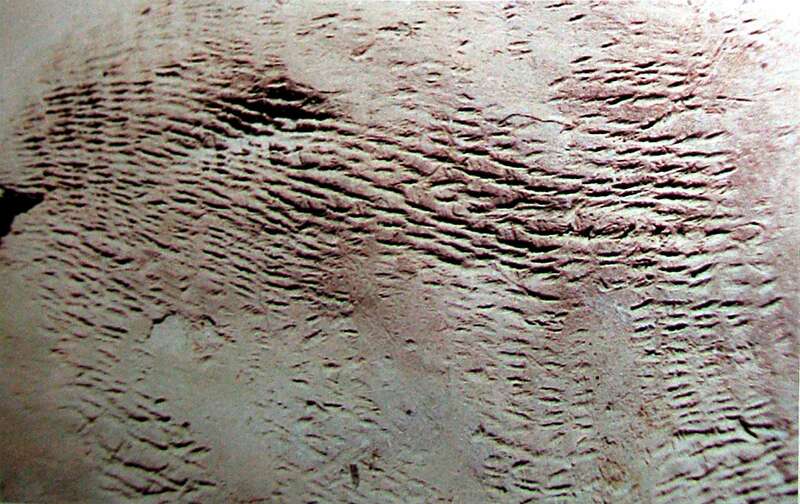 A decade ago, experts did not dare to think about people living in the last ice age making textiles. Unfortunately, much of this technology is evident only to those who have considerable experience with perishable material culture and have examined the original evidence firsthand. Regrettably, most Paleolithic archaeologists have not been trained to do so or have lacked access to the original specimens. Artist L. Balak's recreation of textile production in the Palaeolithic. 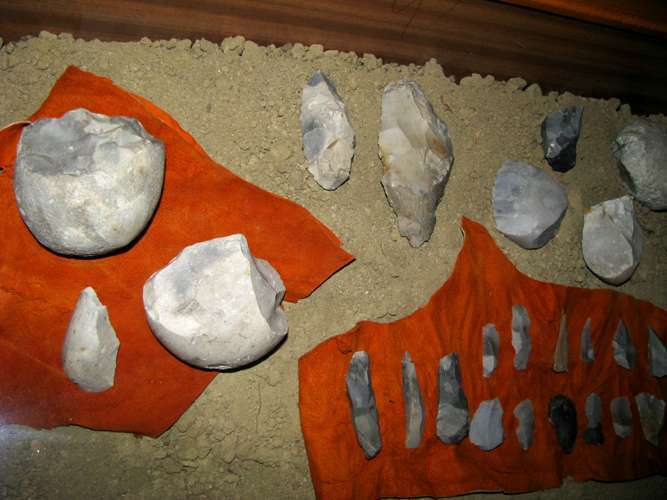 Many bone tools were found at Dolní Věstonice with no obvious purpose, but which could yet serve as part of textile production. Text: Translated from the display. 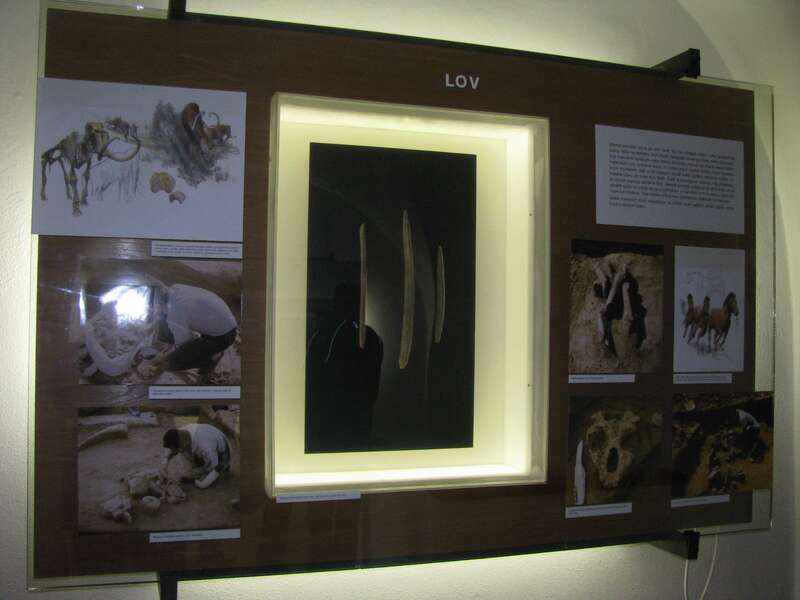 The heading on this display is "LOV" which means Hunting. 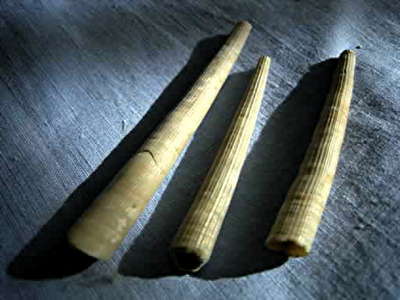 Facsimiles of spear points made of mammoth ivory. 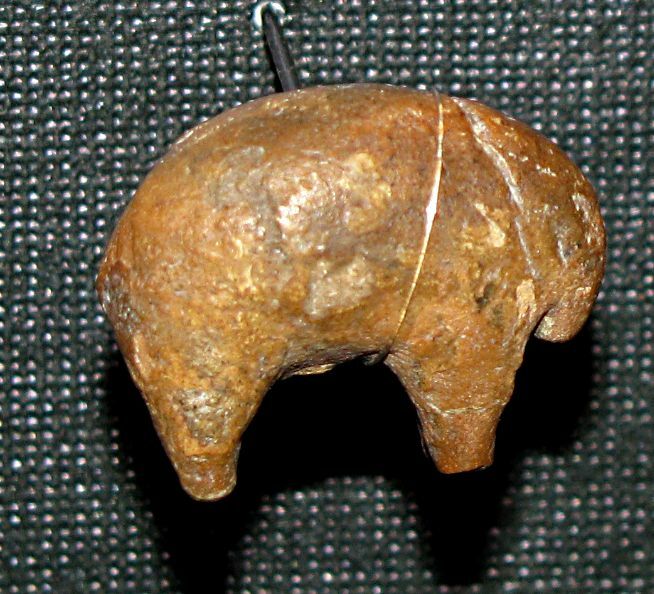 Mammoths were part of their lives. 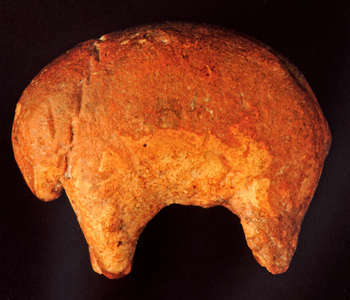 Mammoths were a source of meat, the fat provided fuel, and the skin served as a cover for their dwellings. 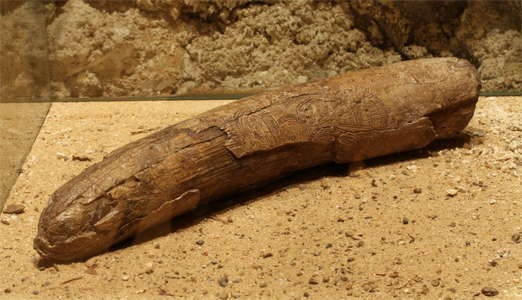 Mammoths even provided material for decorative carvings. 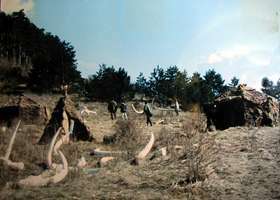 The question of whether hunters actually killed the mammoths, or scavenged their carcasses after death has not been finally resolved. Text: Translated and adapted from the display. 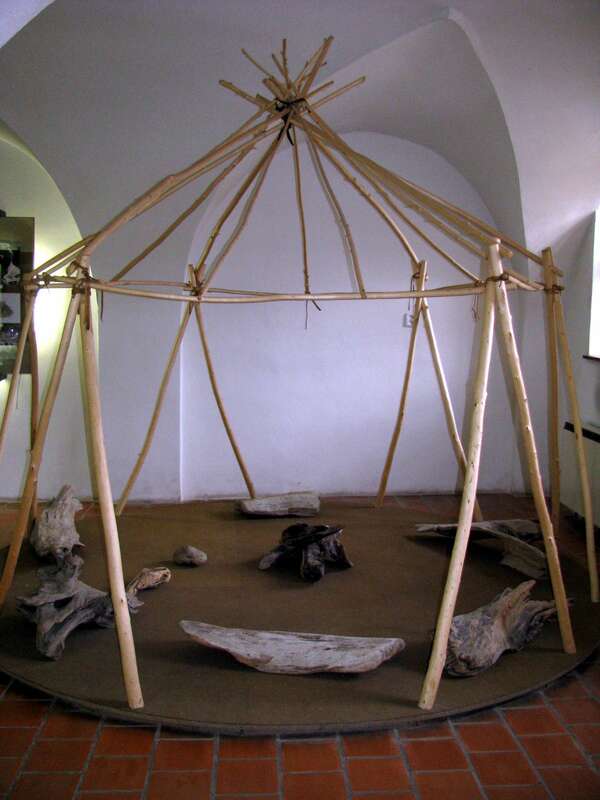 Reconstruction of one possible method of hut construction, using wooden poles in a circular floor pattern. 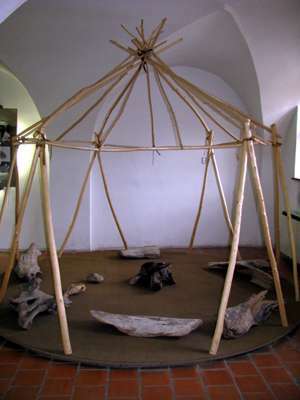 The framework would have been covered with mammoth hides. These may well have been insulated in winter with grass and mud and water, and allowed to freeze, in multiple self supporting layers. Buňatová, M., 1999: Textilní produkce v mladém paleolitu, experiment pro dokumentární film "Úsvit géniů", in: AR LI, Praha, 104 - 111. Neustupný, E. and Neustupný, J., 1960: Czechoslovakia before the Slavs. In: Ancient Peoples and Places. Thames and Hudson, London. 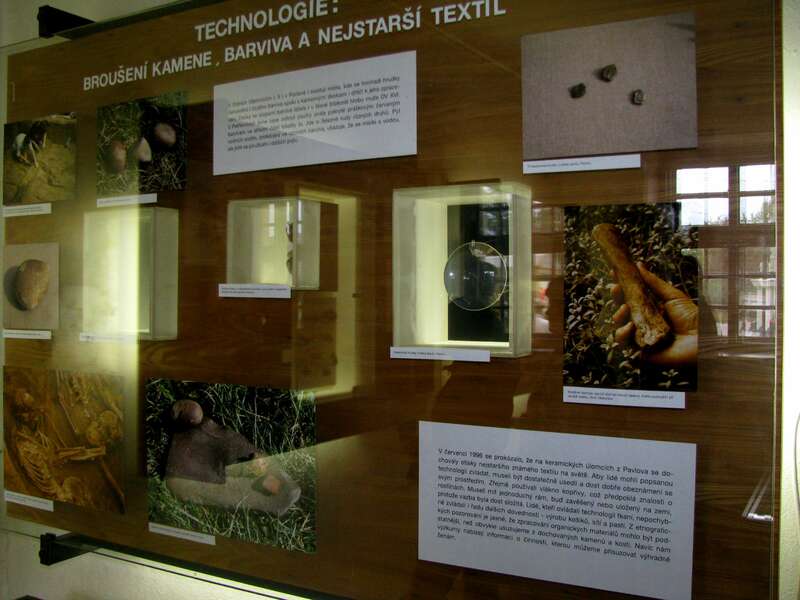 Sosna, D., 2000: Počátky textilnictví. PhD. Dissertation, Department of Anthropology, Masaryk University, Brno.